Homo erectus was probably the first early human species to form part of a hunter-gatherer society, and used more diverse and sophisticated tools than its predecessors. Homo erectus was the first to use fire in a controlled manner. The most famous Homo erectus find is the 'Turkana Boy', a young male discovered in Kenya in 1984. 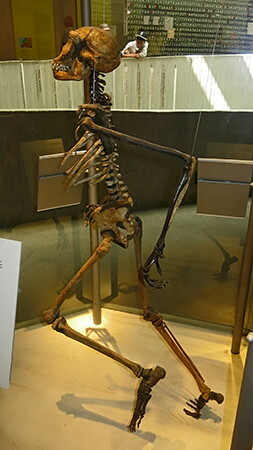 His reconstructed skeleton - with a narrow pelvis and tall, thin body - is interpreted as showing adaptation to the hot climate and the need to run long distances. In comparison, this new find is from a shorter female with a wider chest - a feature more commonly found now in humans from colder, even Arctic climates. The wide pelvis suggests the birth canal and brain size were co-evolving, as H. erectus adapted to the need to give birth to larger babies above the need to adapt to the pressure of external environmental factors. 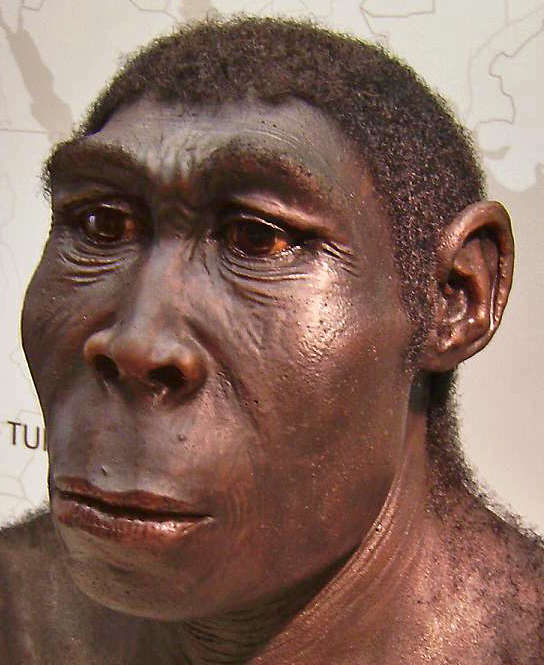 Homo erectus Turkana Boy reconstruction. This cast of Homo erectus, known as Nariokotome Boy, is the almost complete skeleton of a young male individual. It is estimated that his age at death was between 10 and 12 years old, at which time he was 163 cm (5 feet 6 inches) tall, and may have reached 178 cm (6 feet) at maturity. One of the most complete ancient hominid skeletons known, this find began with the discovery of a small fragment of skull in 1984. The complete excavation of the site took five consecutive field seasons, although most of the bones were found in the first two. Another photo of the reconstruction of 'Turkana Boy' by Elizabeth Daynès. 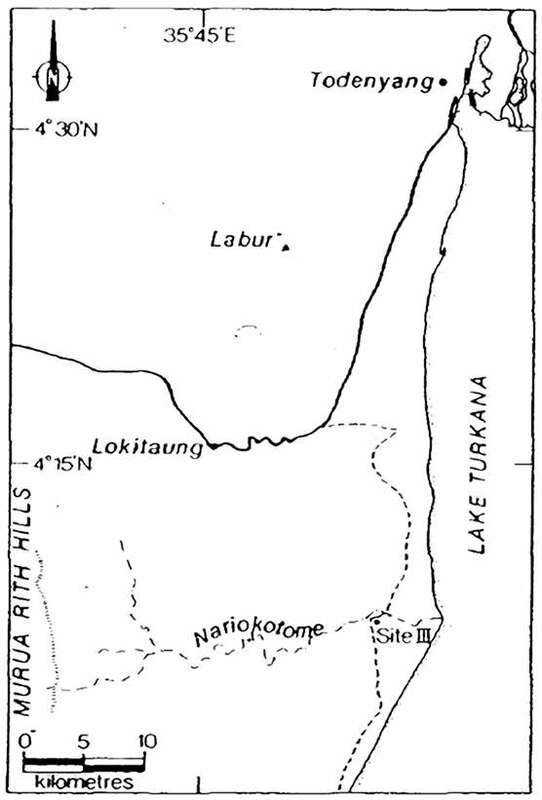 Map of northern Kenya to show the location of the site Nariokotome III. During the course of palaeontological exploration on the west side of Lake Turkana, Bw. 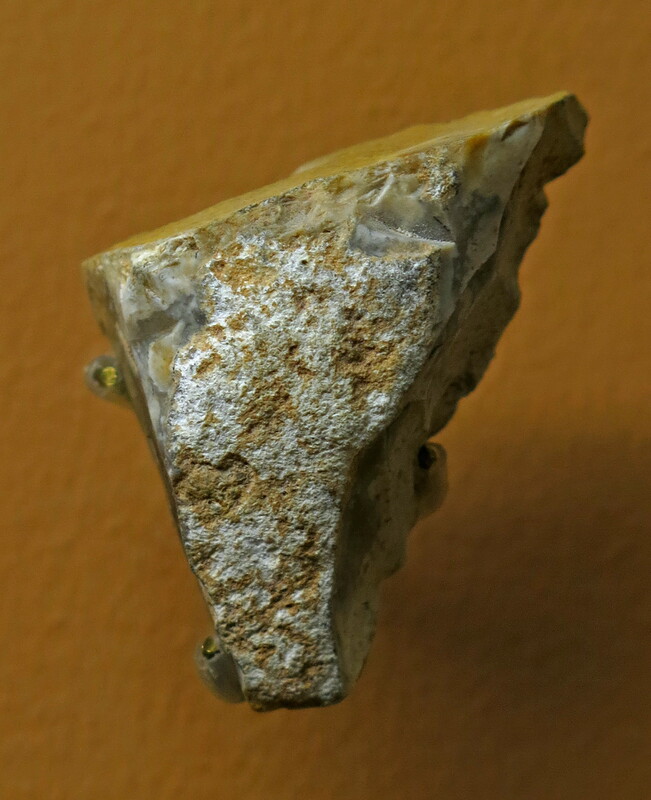 Kamoya Kimeu found a small fragment of hominid frontal bone exposed on the surface at the site of Nariokotome Ill, on the south bank of the Nariokotome River. The approximate latitude and longitude of the site are 4°08'N, 35°54'E. Near the site the Plio-Pleistocene beds strike N 7°E and dip 5° to the west. Exposures are reasonably good along the south bank of the Nariokotome where a section was measured to establish the stratigraphic position of the hominid. Several tuffs occur within this section that have been correlated with tuffs elsewhere in the Turkana Basin on the basis of their chemical composition. 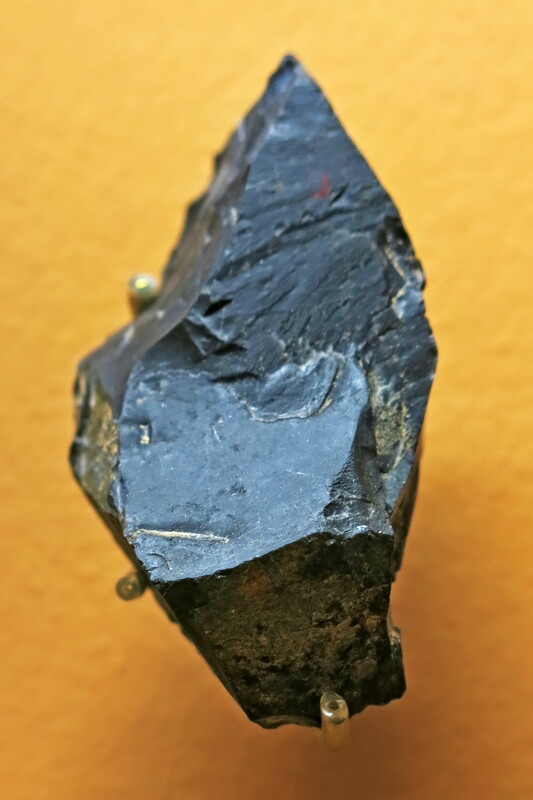 The hominid derives from a siltstone that immediately overlies a tuff identified as a component ash of the Okote Tuff complex of the Koobi Fora Formation. 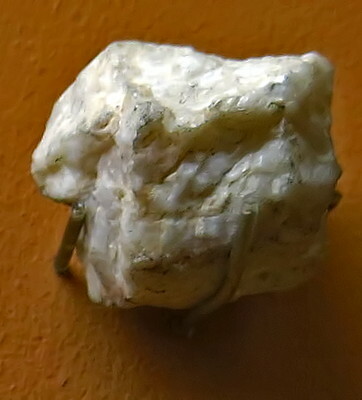 The age of this tuff is ~1.65 Myr. 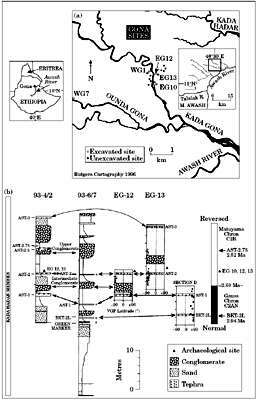 An ash that correlates with Tuff L of the Shungura Formation (Chari Tuff of the Koobi Fora Formation) dated at I .39 Myr lies 34 m above the hominid level. 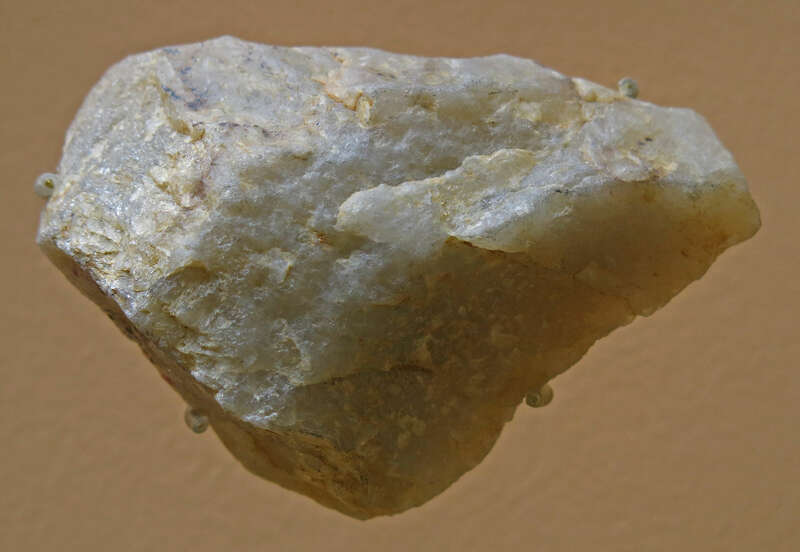 An un-named tuff dated at 1.33 Myr lies 46 m above the specimen. 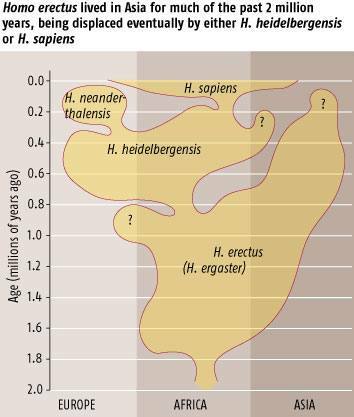 Thus, the hominid is probably very close to 1.6 Myr in age. Lake Turkana seen from the South Island. 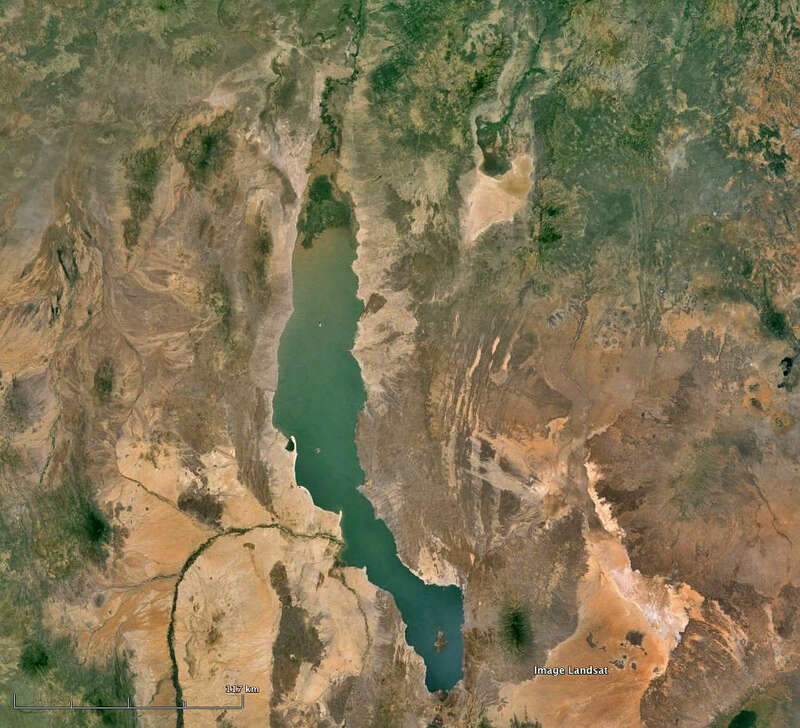 Lake Turkana, formerly known as Lake Rudolf, is a lake in the Kenyan Rift Valley, with its far northern end crossing into Ethiopia. It is the world's largest permanent desert lake and the world's largest alkaline lake. By volume it is the world's fourth-largest salt lake after the Caspian Sea, Issyk-Kul, and Lake Van, and among all lakes it ranks 24th. The water is potable, but not palatable. It supports a rich lacustrine wildlife. The climate is hot and very dry. The rocks of the surrounding area are predominantly volcanic. Central Island is an active volcano, emitting vapors. Outcrops and rocky shores are found on the east and south shores of the lake, while dunes, spits and flats are on the west and north, at a lower elevation. On-shore and off-shore winds can be extremely strong, as the lake warms and cools more slowly than the land. Sudden, violent storms are frequent. 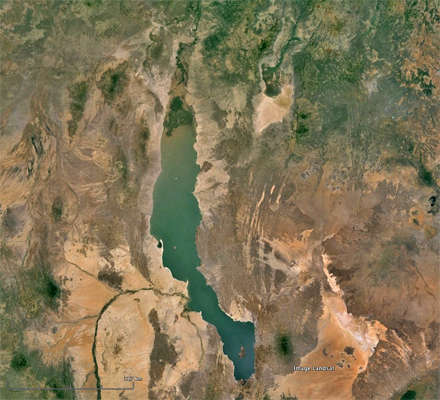 Three rivers (the Omo, Turkwel and Kerio) flow into the lake, but lacking outflow, its only water loss is by evaporation. Lake volume and dimensions are variable. 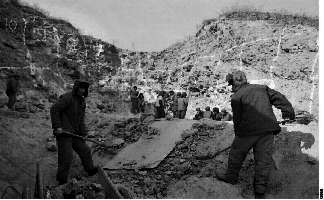 For example, its level fell by 10 metres between 1975 and 1993. Due to temperature, aridity and geographic inaccessibility, the lake retains its wild character. Nile crocodiles are found in great abundance on the flats. The rocky shores are home to scorpions and carpet vipers. Although the lake and its environs have been popular for expeditions of every sort under the tutelage of guides, rangers and experienced persons, they certainly must be considered hazardous for unguided tourists. 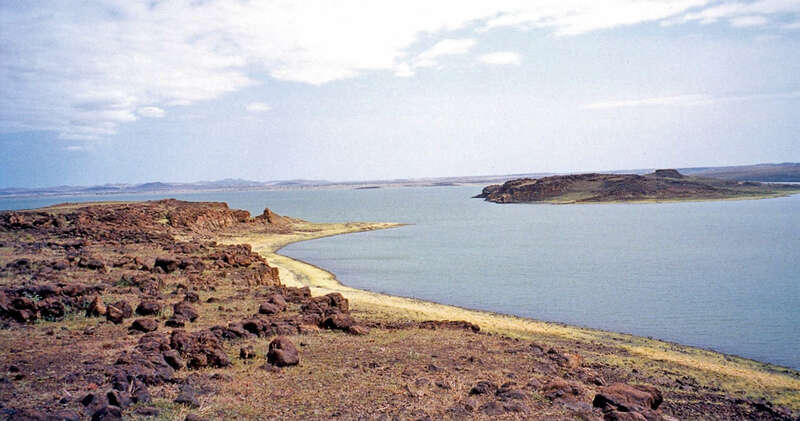 Lake Turkana National Parks are now listed as a UNESCO World Heritage Site. Sibiloi National Park lies on the lake's eastern shore, while Central Island National Park and South Island National Park lie in the lake. Both are known for their crocodiles. The Lake Turkana area is regarded by many anthropologists as the cradle of humankind due to the abundance of hominid fossils. Homo began to walk exclusively on his two 'rear legs'. Soon the spine and pelvis adapted to this type of movement. Man's hands were now free to carry small children, food and tools. Homo erectus was already much taller than Australopithecus. Along with the rest of his body, his legs grew, making him more mobile - an invaluable asset in the vast savannahs. Man also grew in strength, enabling him to kill large animals, a source of food and clothing. Eating raw plants requires strong teeth - particularly the molars which grind food like millstones. But Homo learned to use fire to cook food, allowing it to be chewed with smaller teeth. The less man had to chew, the more energy he saved, and the smaller his teeth and jaw gradually became. 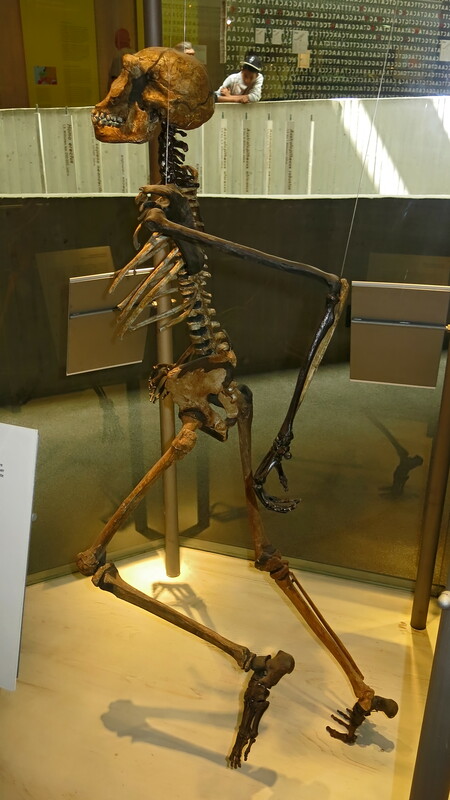 This skeleton may not show it, but Homo erectus had already shed the long body hair typical of great apes. Man was constantly on the move - often enough in the searing sun - so he needed to keep cool. Fur was a hindrance. Homo slowly lost his body hair and developed sweat glands. Perspiration reduces the body temperature, expelling the heat via evaporation. When women lost their body hair, their offspring had no fur to cling to. Children became a burden and had to be carried everywhere. Additionally, they were so ungainly that they needed constant supervision. Consequently the fathers had to help feed and care for them. Slowly the parents formed a more tightly-knit social unit. New types of social interaction arose as fathers became actively involved in raising their children. The enlargement of the brain gave human evolution a decisive nudge. However the brain also consumed large amounts of energy - forcing man to eat more - and required extremely efficient blood circulation. This allowed man to keep a cool head in the scorching sun. The more intelligent these savannah-dwellers became, the more adeptly they could access and exploit the diffuse sources of food. Language - although in its infancy - helped generate new forms of social interaction. Together with man's brain, his manual skills also improved. The verb 'grasp' - with its dual meanings of 'understand' and 'take in one's hand' - points back to the parallel development of brain and hands. Found in 1984 at Nariokotome on Lake Turkana, Kenya, known as Turkana Boy. Circa 1 600 000 BP. Large incisors, smaller molars with thin enamel layer, receding chin, slightly prominent cheek bones. Other characteristics: Modern skeleton. Conical ribcage. Large, slender, and long-limbed. Good runner, rarely used trees, preferred soft food and meat. Man's dominant characteristic is his unmatched ability to manufacture and employ tools. 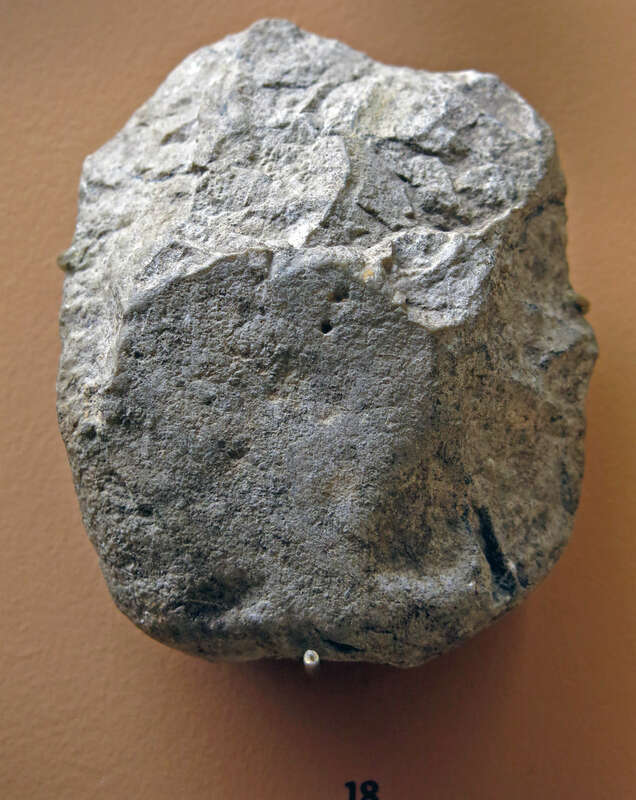 Homo habilis was already using simple stone tools. Their sharp edges enabled him to cut objects too tough for his teeth and fingernails. Man's larger brain also helped improve his dexterity. As he grew increasingly skilful in making stone tools, these tools became more efficient. Soon Homo could use these to carve other objects from wood or bone. 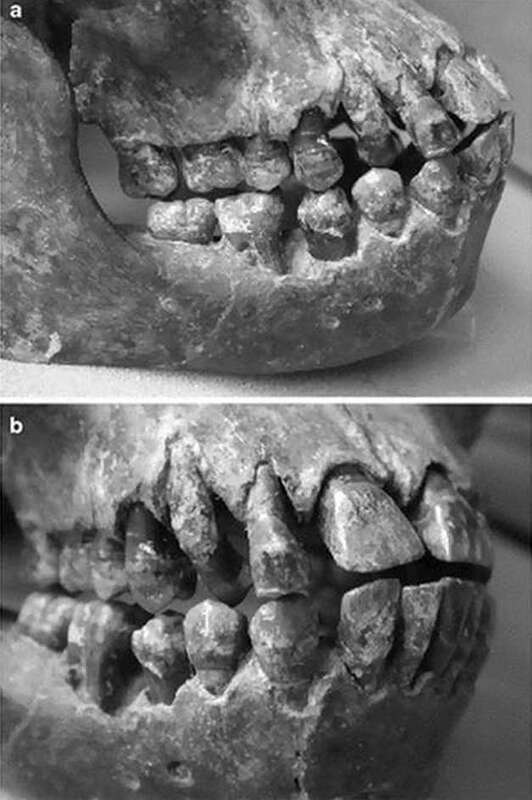 The teeth and jaws of KNM-WT 15000.
a) the recently erupted second permanent molars, premolars and lower canine are viewed laterally. The upper third molar region is broken away on this side (although the unerupted crown is preserved on the other side). 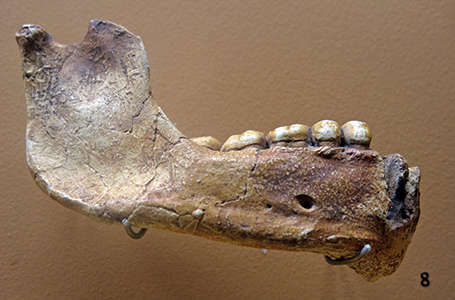 b) the oblique view shows the permanent upper and lower incisors; the permanent canine is erupted in the mandible, but the deciduous canine was still present in the maxilla. 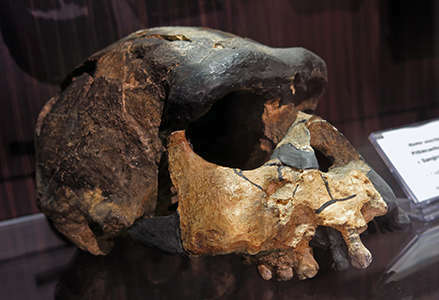 This skull was discovered in Sangiran, Java, Indonesia in 1969 by Towikromo. Age 1 300 000 BP - 1 100 000 BP. Cranium, without lower jaw, Sangiran 17. Circa 1 300 000 BP, Java, Indonesia. Cranium, LANTIAN (PA 102, 105). Circa 1 200 000 BP - 700 000 BP, Gongwangling, China. Circa 780 000 BP - 600 000 BP, Zhoukoudian, China. Soft tissue reconstruction based on the skull reconstruction by G.J. Sawyer & I. Tattersall. They used the Zhoukoudian skull fragments XII, III, XIV/VI, X/I, X/II, the mandible fragments GI/II and the isolated teeth 2, 6, and 13. Closeup of the sculpture above. As always, Élisabeth Daynès has produced a masterpiece of the genre. Homo erectus site, Dragon Bone Hill. Discovery of Locus L at Dragon Bone Hill, viewed from the southwest. Top: Excavation of Skulls X and XI on the right, and the area in left foreground is where Skull XII was later found. 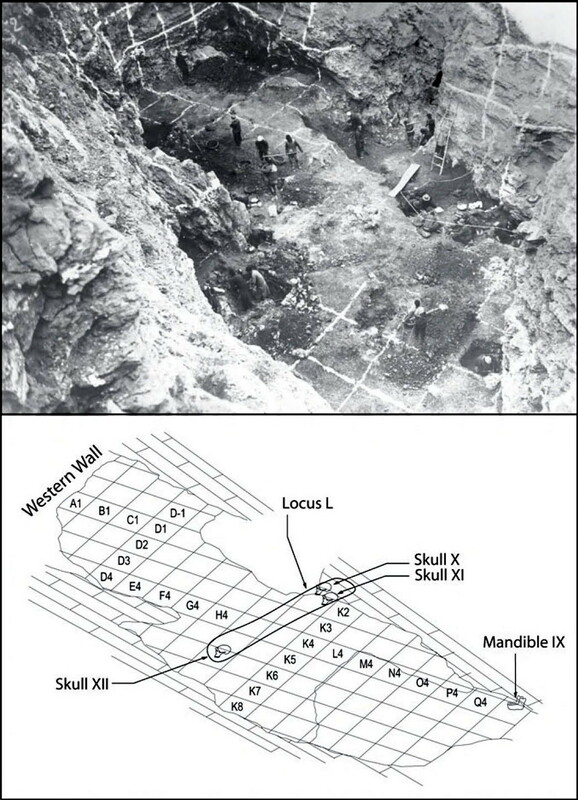 Bottom: Excavation plan view of Locus L showing location of the three hominin skulls discovered in 1936 within Locus L, as well as Adult Mandible IX, discovered in 1959, at Level 27 of Layer 10. Koobi Fora, Kenya. Circa 1 000 000 BP. Cranium only, no lower jaw, KNM-ER 3733. Koobi Fora, Kenya. Circa 1 800 000 BP. Sculpture of the female from Koobi Fora, Kenya, probably KNM-ER 3733. KNM-ER 3733 is a fossilised hominid cranium of the extinct hominid Homo ergaster, which is interchangeably referred to as Homo erectus. It was discovered in 1975 in Koobi Fora, Kenya, right next to Lake Turkana, by Bernard Ngeneo, a field worker for Richard Leakey. 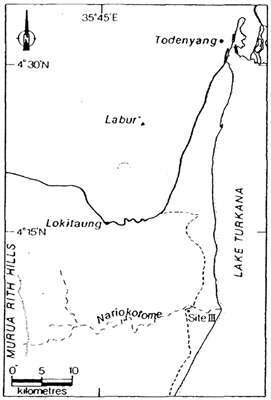 Its geographic location is not to be confused with that of KNM-WT 15000, Turkana Boy, also known as Nariokotome Boy, who was also found near Lake Turkana nine years later in 1984. 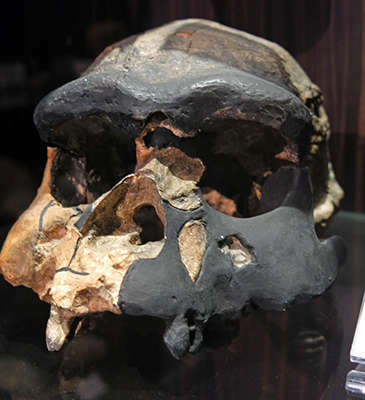 KNM-ER 3733 is one of the oldest Homo ergaster skulls in the world. Recent research using magnetostratigraphy has determined the age of KNM-ER 3733 to be circa 1 600 000 BP KNM-ER 3733 is a find of a near-complete cranium. Its brain size is about 850 cm3. 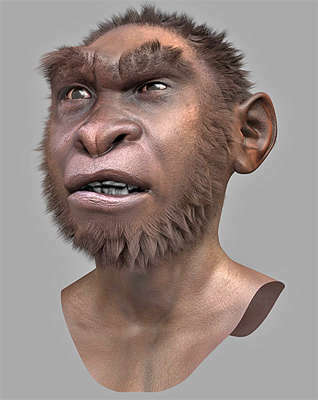 KNM-ER 3733 was compared to male fossils KNM-ER 3833 and KNM-WT 15000 (Turkana Boy), who were also found at the Koobi Fora site, and because of this, is said to be female. The features of KNM ER 3733 are less robust compared to the two male crania. It is considered to be an adult because of the extensive wear of its teeth, the fact that its third molars were present before the individual died, and because its cranial sutures were fully fused, which is only possible in adult specimen. Sculptor: Atelier Élisabeth Daynès, Paris, for the Neanderthal Museum, 1996. Koobi Fora, Kenya. Circa 1 900 000 BP - 1 600 000 BP. 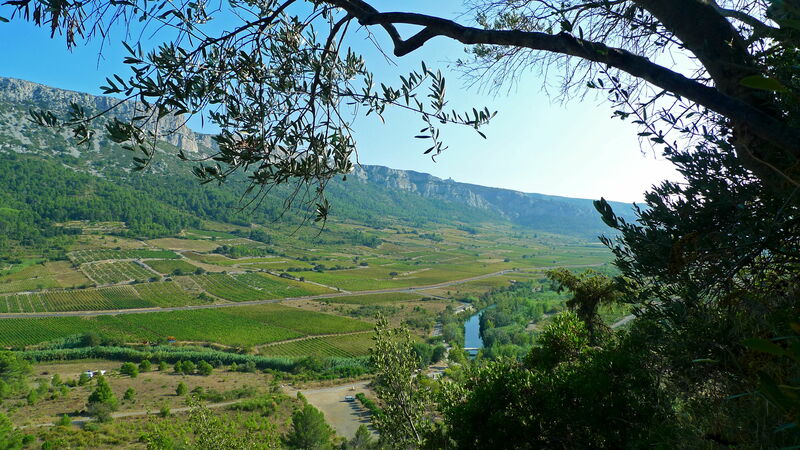 La Caune de l'Arago, Arago Cave, is named after the Arago valley, which it overlooks. La Caune de l'Arago, Arago Cave, is also known as Tautavel Cave. 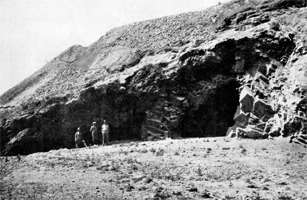 The cave had a sedimentary fill 11 metres thick. Twenty periods of prehistoric habitats have been unearthed. Many human remains dated from 600 000 to 400 000 years old have been discovered during excavations there. Anthropologists who have studied the deposits classify them as 'pre-neanderthal', that is to say direct ancestors of the Neanderthal. 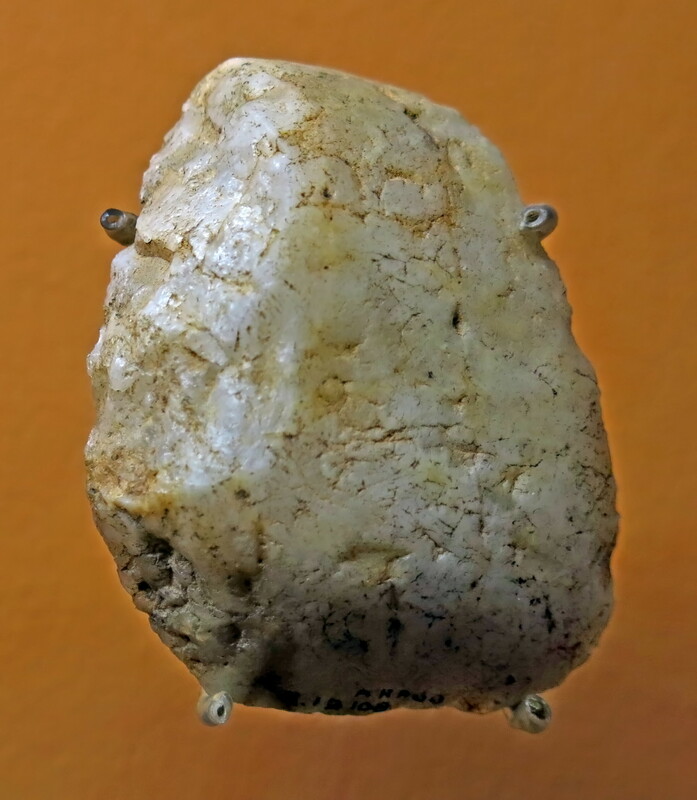 The Tautavel industry is composed of pebble tools and flakes. The original piece of flint is shaped to obtain a nucleus, from which flakes are struck. Then the edges of the flakes are modified to create tools of various types. 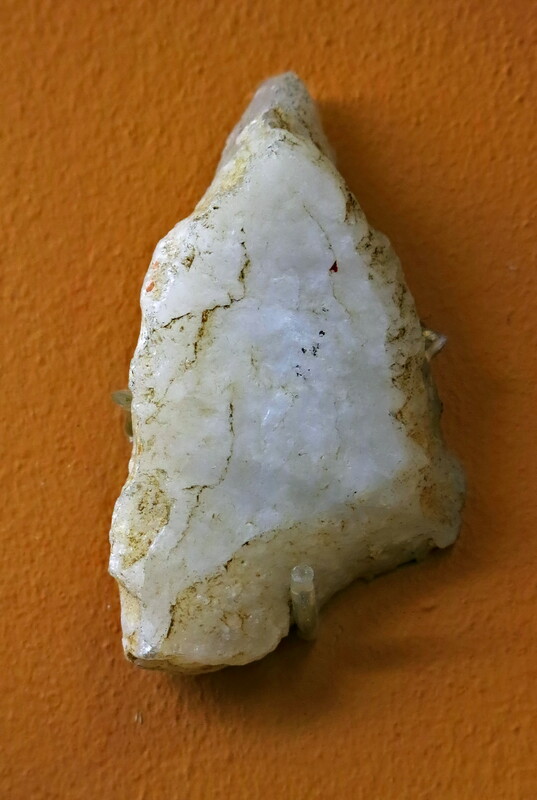 These so-called microlithic industries are considered to be atypical. In the lower palaeolithic, simple techniques of knapping produce flakes whose edges must be strongly retouched to be usable. In addition, the rocks which are available for harvest in the immediate vicinity are not always appropriate to produce an elegant tool. It is therefore sometimes difficult to classify the tools into neat categories. 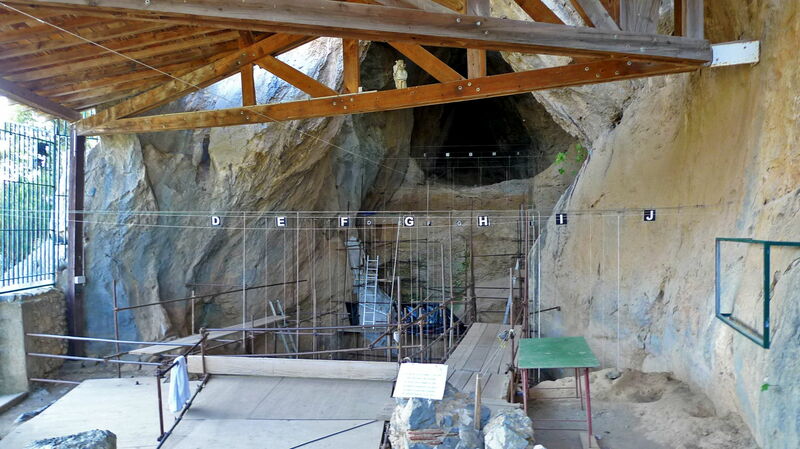 This is a recreation of part of the floor of Arago Cave, in which remains of 40 individuals were found. The cave was paved in a haphazard way, but no hearths were found. Tools used by Tautavel Man. Tools used by Tautavel Man. Note the small size. Tool used by Tautavel Man. This is the view of the valley from a seat on rocks just outside the cave shelter. The inhabitants would have had an excellent view of animals moving through the valley. 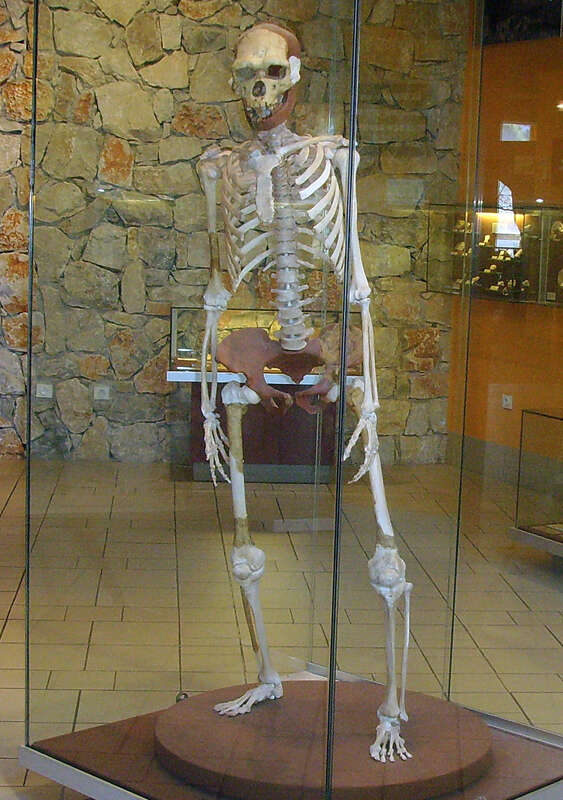 Tautavel Man (Homo erectus tautavelensis ), is a proposed subspecies of the hominid Homo erectus, the 450 000 years old fossil remains of whom were discovered in the Arago Cave in Tautavel, France. 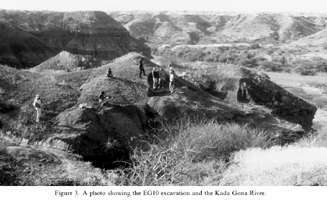 Excavations began in 1964, with the first notable discovery occurring in 1969. The skeletal remains of two individual hominids has been found in the cave: a female older than forty (Arago II, July 1969), and a male aged no more than twenty (Arago XXI, July 1971, and Arago XLVII, July 1979). 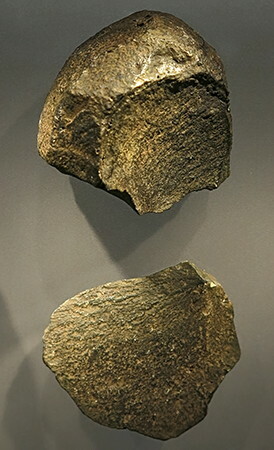 Recovered stone tools originate from within a 5 kilometres (3.1 mi) radius of the cave, while animal bones suggest the inhabitants could travel up to 33 kilometres (21 mi) for food. 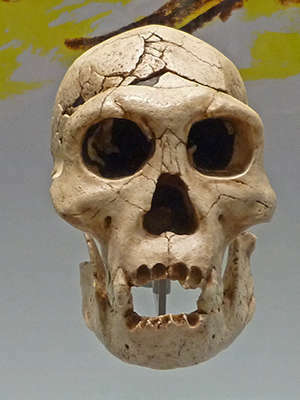 The male skull has a flat and receding forehead with well-developed supraorbital ridges ('eyebrows') and a large face with rectangular eye sockets. The cranial cavity had a volume of 1 150 cm3. 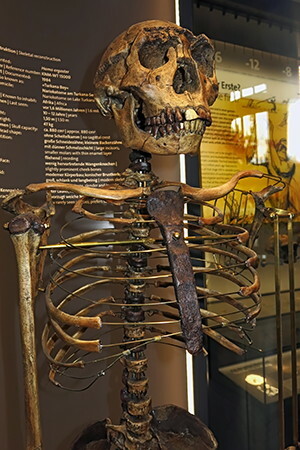 The rest of the skeleton has been reconstructed from 75 fossil remains and casts from fossils found at other sites; an interpretation suggesting a sturdier skeleton than in modern humans and a height of 165 cm (5 ft 5 in). Through the thousands of years from the time that Arago XXI died, changes occurred to the structure of the bone known as 'taphonomic transformations', these modifying the shape of skull. These had caused parts of the bone to become slightly bent, including the front of the skull to lose symmetry. 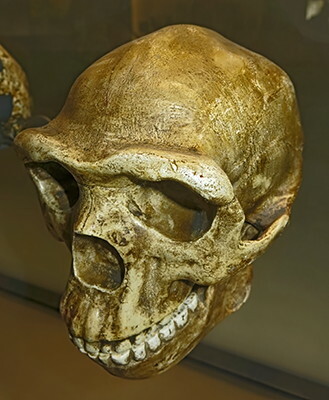 Three-dimensional imaging using computers allowed a morphometric analysis of the skull and this was used to compare with skull dimensions of Homo sapiens sapiens and also to obtain a computer generated image of the hominids face. Compared to H. erectus in North Africa and China, H. erectus tautavelensis is closer to early H. sapiens and thus form a morphologically distinct group together with other European Middle Pleistocene hominids found in Steinheim, Swanscombe, and Pontnewydd, because they show some of the characteristics of Neanderthals. The oldest indirect evidence of hominids in Europe are date to perhaps 1 to 2 million years ago and while Arago is certainly younger, the stalagmite floor under the cave deposits has been ambiguously dated to 700 000 years old by electron spin resonance but to 300 000 years old by thermoluminescence. No signs of fire, ash, charcoal, burned stone, or clay is documented in the cave which seems to suggest the art of fire is a recent discovery, though traces at a 1 to 4 million years old erectus site in East Africa indicate the opposite. A reconstruction of Homo erectus, exhibited at the Westfälisches Landesmuseum, Herne, Germany (lwl-landesmuseum-herne.de). 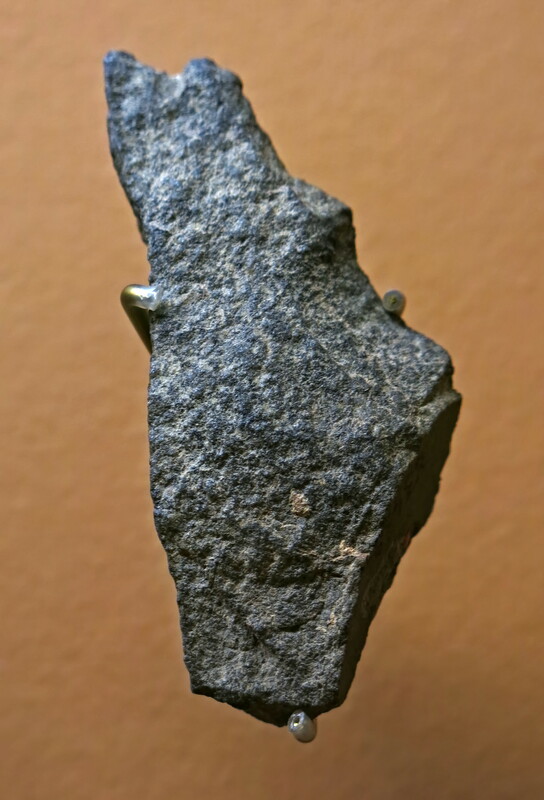 ~1 750 000 years old, Kenya. Source and text: Display, Paléosite at Saint Césaire. A photograph of the footprint's upper footprint surface showing good definition of the toe pads; the second toe is partially obscured by the third toe. 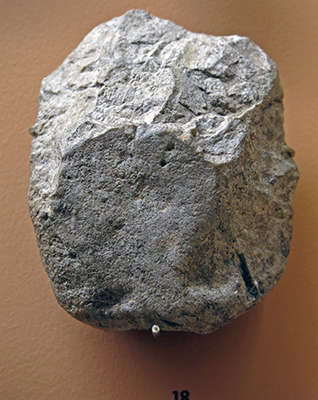 This fossil footprint found near Ileret, Kenya, is 1.5 million years old. These footprints are the oldest ever found of the human genus. 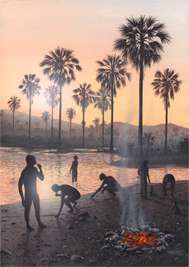 H. erectus at dawn, gathering shellfish. The fire is smouldering after blazing all night. Photograph: ©Richard Bizley FIAAA, used by kind permission. 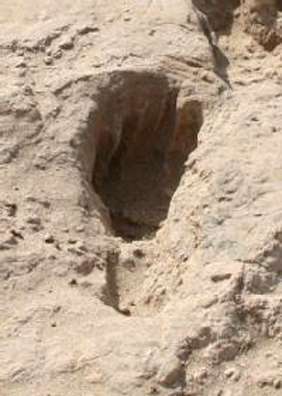 The footprints were probably made by Homo erectus, and they match a men's shoe size of about 9. This one looks very much like the footprint of anthropologist Brian Richmond. Laser scanning of the footprints show all the hallmarks of a modern human stride. Scientists digging in a Kenyan desert have found what they believe to be the oldest humanlike footprints. Several individuals laid them down 1.5 million years ago in what was a muddy track. The scientists discovered not just one set of footprints, but two. The second set was left about 1,000 years after the first set. "It's incredible. I've never excavated anything like this before," says team director John Harris of Rutgers University. Reporting in this week's issue of the journal Science, the anthropologists say the creatures that made the prints were probably Homo erectus. That's believed to be a direct ancestor of modern humans, and one that appears to have been built much the way modern humans are. "The prints match a men's shoe size of about 9, which gives you a height of about 5 feet 9 inches," says Brian Richmond of George Washington University, who was part of the excavation team. "Here, we have really compelling evidence that they were walking with a long stride, they had an arch in the foot the way we have, and the arch puts a spring in our step, which makes walking more efficient," he says. The region is rich with animal footprints as well, including antelopes, a form of zebra and birds. During the time the prints were made, the region was probably a river valley near a lake. The evolution of an arch in the foot indicates a spring ligament in the foot, which increases the efficiency of walking by storing some of the energy from the falling weight of the walker in each step, and then returning it up the leg on the rebound. The big toe is also aligned with the other toes, something not found in earlier ancestors and other primates. Its large size is necessary to absorb the walker's weight as the foot rolls forward and then lifts off the ground before the next step. Harris says the area where these individuals lived was undergoing a drying period at the time the prints were made. Trees and water might have been growing scarce, so Homo erectus would have had to walk farther for water and food. Dan Lieberman, an anthropologist at Harvard University, says the footprints confirm that the evolution of the foot was crucial to becoming human. For one thing, it allowed people to run. "Imagine you are a Homo erectus and you are hungry," he says. "And you want to kill something for dinner. The weapons available to you are incredibly primitive, so one thing early hominids might have included in their repertoire of hunting strategies was to run animals in the heat." Eventually, he says, the prey would collapse and could then be killed. The scientific team will return to the site next summer. They say the first track ends at a small hill, and they expect to find more prints underneath the hill. What may be the oldest human footprints in the world have been discovered in Africa. 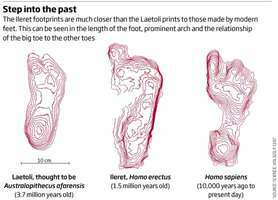 The 1.5 million-year-old prints reveal that our ancient ancestors walked like us and had modern-looking feet. One set of seven footprints shows an individual about 175 centimetres tall standing with legs astride, before moving slowly across what would have been a muddy, slippery surface. 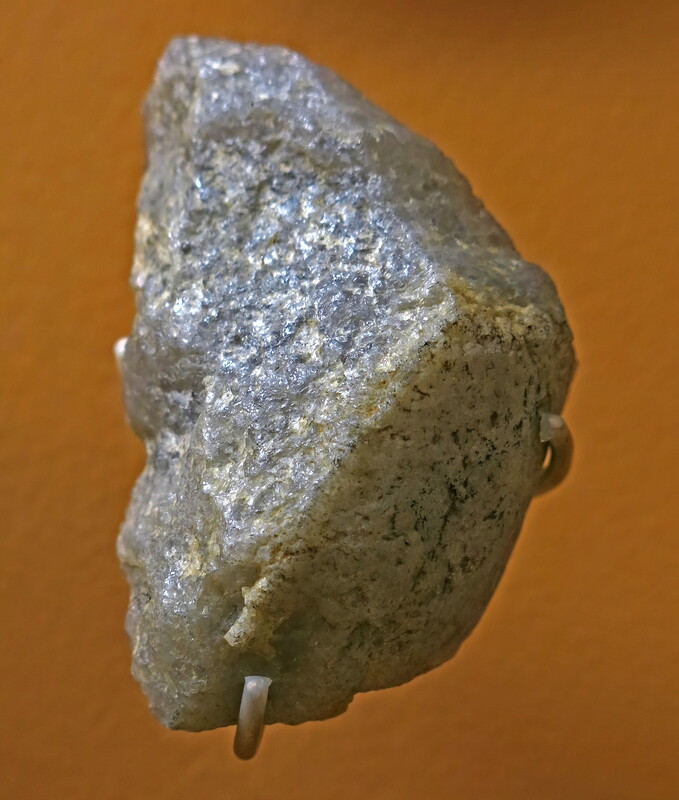 The rare find was made near Ileret in Kenya by a team co-led by John Harris of Rutgers University in New Jersey. 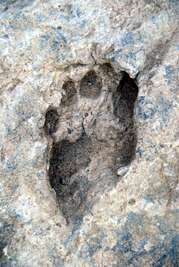 Professor Harris said the size of the fossil footprints indicated they were made by extinct humans, early Homo erectus, who inhabited the region. "Homo erectus was the precursor of our own species, Homo sapiens. That's the exciting part," Professor Harris said. The prints show that, like us, they had arched feet, big toes pointing forward in line with the rest, and they transferred their weight from heel to ball to big toe as they walked. Four sets of well-preserved adult footprints, and a small, single impression, probably made by a child, were found alongside those of other creatures, including antelopes. 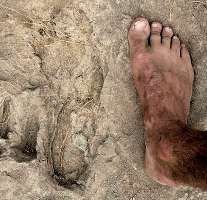 "This trail of footprints provides us with a unique snapshot in time of the animals that were living on this landscape 1.5 million years ago," said Professor Harris, whose study is published in the journal Science. The only older known footprints were discovered 30 years ago by Mary Leakey at Laetoli in Tanzania. But these 3.7 million-year-old impressions were made by a less advanced hominid, Australopithecus afarensis. Although it walked upright, it had a more ape-like big toe, that stuck out at an angle, and a shallower arch, Professor Harris said. The British researchers, Robin Crompton and Todd Pataky, of the University of Liverpool, said the human foot was one of our most distinctive adaptations. 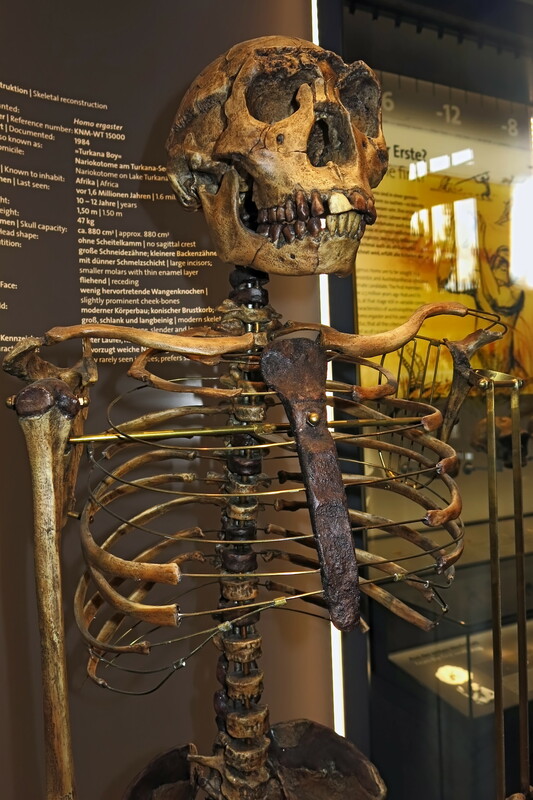 The 26 bones held together by ligaments and tendons and protected by fatty pads and thick skin had allowed modern humans to travel long distances, by acting as both shock absorbers and stiff levers to push off the ground. The Kenyan footprints were an important find because they were the "oldest attributable to our own genus, Homo," they wrote in the journal. "The finding heralds an exciting time for studies of the evolution of human gait." In 2003, 345 000 year old footprints found in southern Italy were described by researchers. Known as the "devils' trails", they were made by extinct early humans in Europe. Two years later, in NSW, it was announced that hundreds of 22,000-year-old footprints - the oldest in Australia and the largest collection of its kind in the world - had been found in Mungo National Park. In the foreground, Christine Galvagna, a Rutgers undergraduate at the time, meticulously cleans a trail of hominid footprints as Professor Harris (dark blue shirt) looks on. Optical laser scan images for a series of footprints showing dimensions and depth. Early humans had feet like ours and left lasting impressions in the form of 1.5 million-year-old footprints, some of which were made by feet that could wear a size 9 men's shoe. 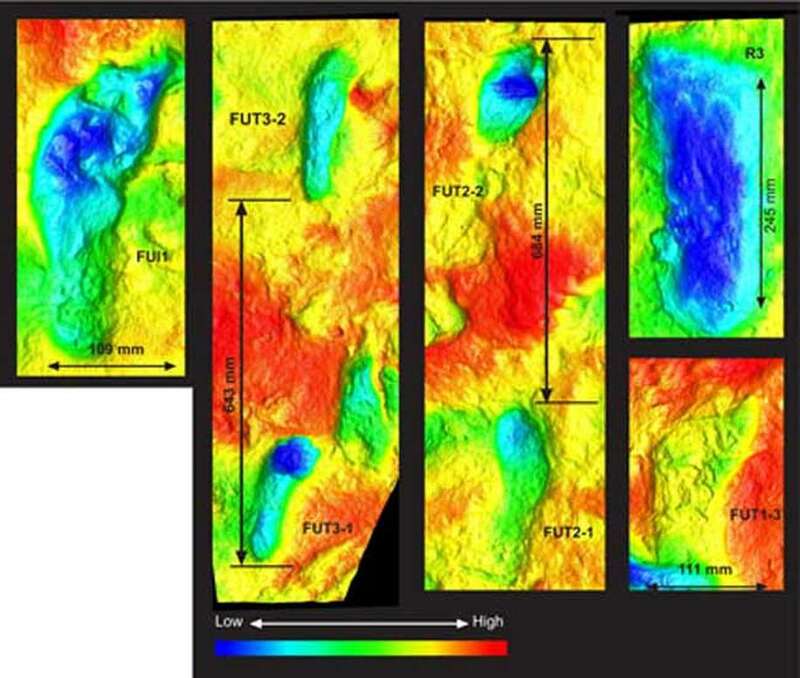 Harris and other colleagues report in the Feb. 27 issue of the journal Science on finding several footprint trails within two sedimentary rock layers. An upper sedimentary layer included two trails of two prints each, one group of seven prints, and a variety of isolated prints. The lower layer had a trail of two prints and a single isolated print likely from a smaller, juvenile human. The researchers identified the footprints as probably belonging to a member of Homo ergaster, an early form of Homo erectus. Such prints include modern foot features such as a rounded heel, a human-like arch and a big toe that sits parallel to other toes. By contrast, apes have more curved fingers and toes made for grasping tree branches. The earliest human ancestors, such as Australopithecus afarensis, still possessed many ape-like features more than 2 million years ago — the well-known "Lucy" specimen represents one such example. These latest footprints at Ileret, Kenya, appear intriguingly close by to another early human site. Researchers in 1984 found a nearly complete Homo erectus skeleton, dubbed the "Turkana Boy" specimen, just across the waters of Lake Turkana. Turkana Boy's delicate foot bones were not well preserved. But the new footprints could represent the shoe that fits the wearer, so to speak. "Many people have predicted this, but now we have the solid evidence for modern foot anatomy," Harris told LiveScience. "It's like a giant jigsaw puzzle, and those footprints complement the skeleton from the other end of the lake." Modern feet mark just one of several dramatic shifts in early humans, specifically regarding the appearance of Homo erectus around 2 million years ago. 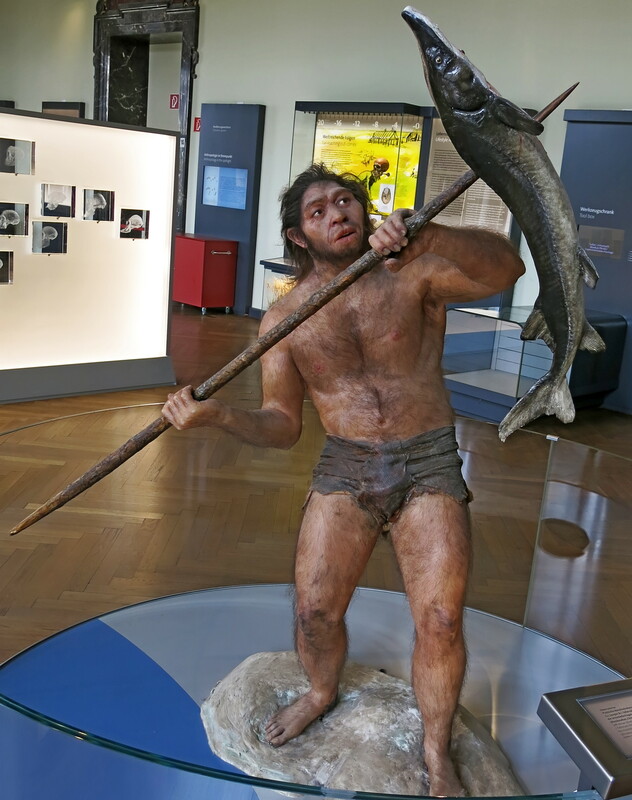 Homo erectus is the first hominid to have the same body proportions as modern Homo sapiens. 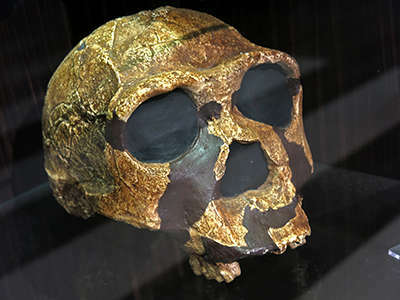 "We're seeing a very different hominid at this stage," Harris said, pointing to both an increase in size and change in stride during the relatively short time between Australopithecus (the first in this genus lived about 4 million years ago and the last died out between 3 million and 2 million years ago) and Homo erectus. The latter hominids would have been able to travel more quickly and efficiently over larger areas. This matches a pattern of more widely-distributed sites containing artifacts such as tools from 1.5 million to 1 million years ago, which may also point to wider-ranging early humans. "You might even think in terms of dietary quality here, because maybe they're incorporating more meat into their diet," Harris said. "They would have competed with quite a large carnivore guild; lions, leopards, and all the cats that eat meat." The Homo erectus footprints now lead further into the past of human evolution, as researchers may shift their focus to earlier examples of physical changes in human ancestor species. 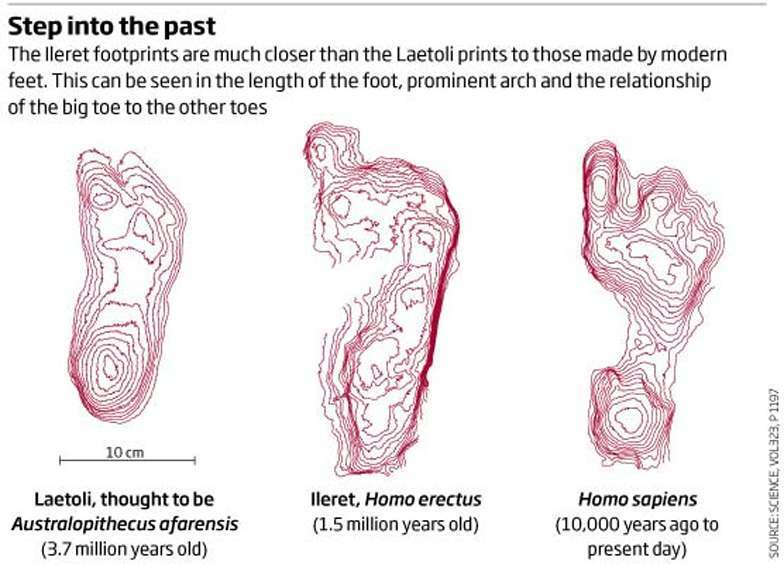 "It's going to bring up controversy again about the Laetoli prints," Harris noted, referring to footprints preserved in volcanic ash roughly 3.6 million years ago in Tanzania. Anthropologists continue to debate whether these older footprints from an earlier "Lucy" type hominid show that Australopithecus walked about easily or awkwardly on two legs. Other findings may yet be revealed with the latest footprints at the Ileret site. The prehistoric landscape near various water sources was likely a muddy surface that preserved a whole range of animal tracks, Harris hinted — perhaps fodder for additional studies in the future. Footprints laid down near Lake Turkana in north-west Kenya 1.5 million years ago were made by human ancestors with essentially modern foot anatomy and gait. They are the second oldest hominin footprints known, after the 3.7-million-year-old Laetoli prints found by anthropologist Mary Leakey in Tanzania in 1978, which are more ape-like and are suspected to be from a species of Australopithecus. More importantly, they are the oldest made by human ancestors; probably early Homo erectus, who was thought to share our stature, foot anatomy and springy, efficient stride. Because fossilised foot bones are fragile, and thus scarce, researchers have not previously been able to verify their inferences about the foot anatomy or gait of H. erectus. "Between 1.8 and 1.5 million years ago, H. erectus evolved rapidly, [becoming] very different to anything that came before," says Matthew Bennett of Bournemouth University, UK, who was part of the team. Those differences included shorter arms, longer legs and - the footprints show - a modern foot and an energy-saving bounce from the arch and big toe. Like modern apes, earlier human ancestors had short legs and strides, and a flat-footed, less efficient gait. The evolved stride matters, says Bennett, because the increasing mobility of H. erectus opened up a wider range of habitats to occupy and exploit. Bennett and his colleagues unearthed two layers of footprints at Koobi Fora, an archaeological site near the town of Ileret in Kenya. The lower layer includes two trails, each with two footsteps, and an isolated footprint; the upper layer had three trails, one with seven steps. The prints are sandwiched between layered deposits of volcanic ash whose age is well known and indicates that both sets of prints were made between 1.53 and 1.51 million years ago. 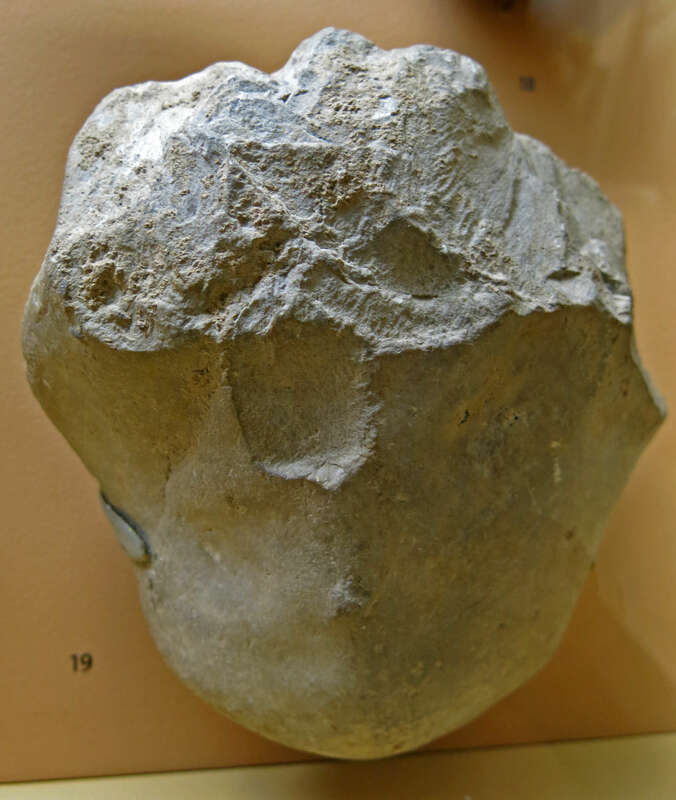 "We see characteristic human prints, with a clear heel, an imprint on the outside of the foot, and then a really deep impression underneath the ball of the foot," says co-author Brian Richmond, a palaeoanthropologist at George Washington University in Washington DC. "Whereas the Laetoli prints have debatable evidence of these modern characteristics, the prints from Kenya are compelling." On several key features, including length, a pronounced arch, and the position of the big toe in relation to the others, the Ileret prints are much more modern than those from Laetoli. Crucially, they reveal a modern stride in which weight shifts from the heel to the ball of the foot and then to the big toe, providing a platform to push off from. 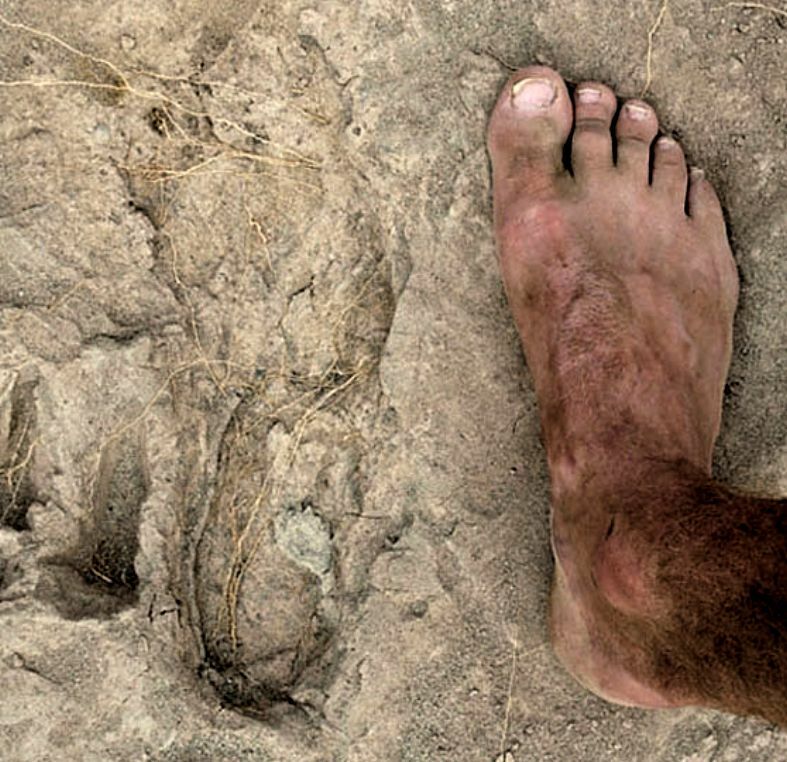 For team member Jack Harris of Rutgers University in New Brunswick, New Jersey, the footprints confirm what researchers have been piecing together about how H. erectus evolved. "They had the anatomy to range over longer distances and move into more diverse habitats," he says. Analyses of the KNM-WT 15000 Homo erectus juvenile male partial skeleton from Kenya concluded that this species had a tall thin body shape due to specialized locomotor and climatic adaptations. Moreover, it was concluded that H. erectus pelves were obstetrically restricted to birthing a small-brained altricial neonate. Here we describe a nearly complete early Pleistocene adult female H. erectus pelvis from the Busidima Formation of Gona, Afar, Ethiopia. This obstetrically capacious pelvis demonstrates that pelvic shape in H. erectus was evolving in response to increasing fetal brain size. 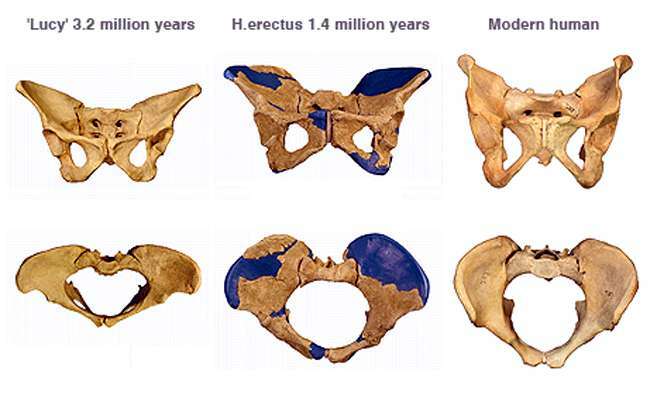 This pelvis indicates that neither adaptations to tropical environments nor endurance running were primary selective factors in determining pelvis morphology in H. erectus during the early Pleistocene. A reconstruction of the 1.2 million-year-old pelvis discovered in 2001 in the Gona Study Area at Afar, Ethiopia, that has led researchers to speculate early man was better equipped than first thought to produce larger-brained babies. 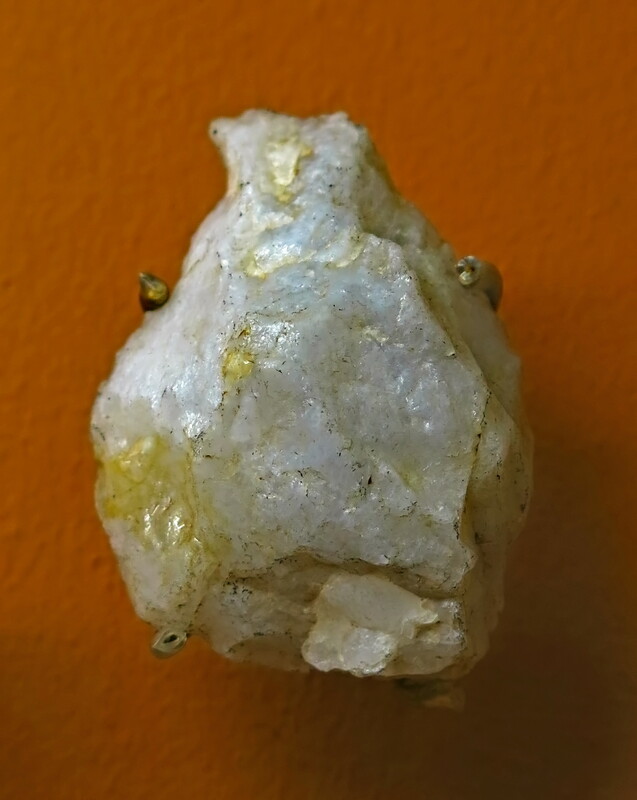 The actual fossils remain in Ethiopia. A new Homo erectus fossil suggests that females had large, wide pelvises in order to deliver large-brained babies. Being born with a larger brain meant our ancestor became independent far more quickly than modern human infants. The new finding, published in Science magazine, conflicts with earlier ideas that suggest they had a tall, thin body shape adapted for running. 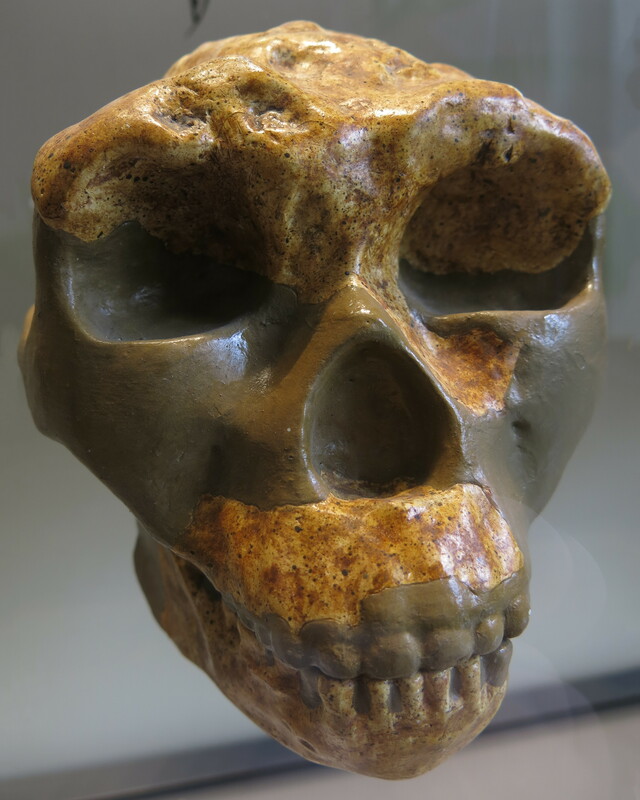 Homo erectus is thought to be the first human-like creature to move out of Africa to colonise the world. The now extinct hominid species may also have been the first to control fire. The near-complete 1.4 million-year-old female pelvis was found near Gona in northern Ethiopia. As it was pieced together, the archaeologists were struck by the unusual width of the pelvis. Scott Simpson, a palaeontologist from Case Western Reserve University in Cleveland, Ohio, US, was one of those who made the discovery. "Proportionally her hips are wider than those of modern humans," he says. 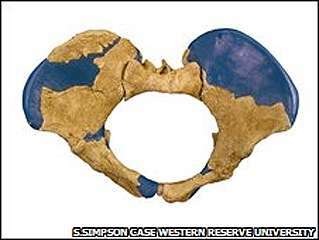 A comparison of modern human and earlier pelivises (S.Simpson Case Western Reserve University) Pelvis size indicates how large the newborn's head could be. 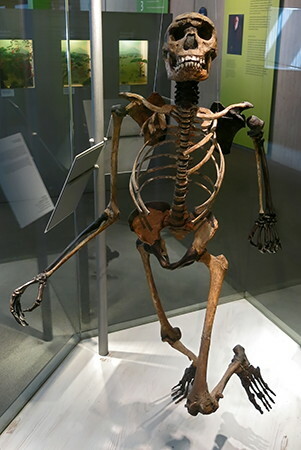 Earlier hominids such as the three-million-year-old Australopithicus afarensis, made famous by the "Lucy" skeleton found in 1974, have a much narrower pelvic opening. In comparison, more recent hominids found in China, Israel and Spain have wider pelvises. The researchers say the wider pelvis meant H. erectus could have given birth to babies that were 30% bigger than previously thought. Having a larger brain size meant the young hominid was dependent on its mother for less time than a modern human baby, a useful survival adaptation in the African savannah where they lived. The researchers say the erectus brain probably grew quickly before birth; but after birth, growth-rate then slowed to somewhere between that of modern humans and chimpanzees. But Dr Simpson points out that H. erectus was much more like a human than a chimp. "Homo erectus was the first hominid species that left Africa; they were technologically sophisticated with stone tools; they hunted animals. Many behaviours we consider unique to [modern] humans were present in Homo erectus." 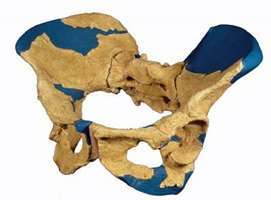 A recently discovered female pelvis is changing minds about the head size of an ancient human ancestor, Homo erectus, and consequently revising notions about how smart they may have been. Found in Gona, Ethiopia, not far from the site that yielded the 3.2 million year old remains of the famed Australopithecus afarensis "Lucy," the pelvis indicates that Homo erectus, which lived in Africa roughly 2 million years ago, had a larger birth canal than originally suspected and could have given birth to babies with bigger brains. Before the female pelvis was found, evidence from the pelvis of a juvenile male led researchers to project that the cranial circumference and capacity of newborn Homo erectus babies was 30 percent smaller than more recent projections based on the newly discovered pelvis. Sileshi Semaw, a paleoanthropologist at the Stone Age Institute and Indiana University-Bloomington, and his colleagues assert that the head of a baby born from this Homo erectus could have been 318 millimeters in circumference. This is at the lower end of the spectrum of modern day human beings whose cranial circumferences at birth typically range from 320-370 millimeters. Semaw and colleagues present their findings in the Nov. 14 issue of Science. The research is funded in part by the National Science Foundation. A reconstruction of the 1.2 million-year-old pelvis discovered in 2001 in the Gona Study Area at Afar, Ethiopia, that has led researchers to speculate early man was better equipped than... Click here for more information. BLOOMINGTON, Ind. -- Discovery of the most intact female pelvis of Homo erectus may cause scientists to reevaluate how early humans evolved to successfully birth larger-brained babies. "This is the most complete female Homo erectus pelvis ever found from this time period," said Indiana University Bloomington paleoanthropologist Sileshi Semaw. "This discovery gives us more accurate information about the Homo erectus female pelvic inlet and therefore the size of their newborns." A reconstruction of the 1.2 million-year-old pelvis discovered in 2001 in the Gona Study Area at Afar, Ethiopia, that has led researchers to speculate early man was better equipped than first thought to produce larger-brained babies. The actual fossils remain in Ethiopia. 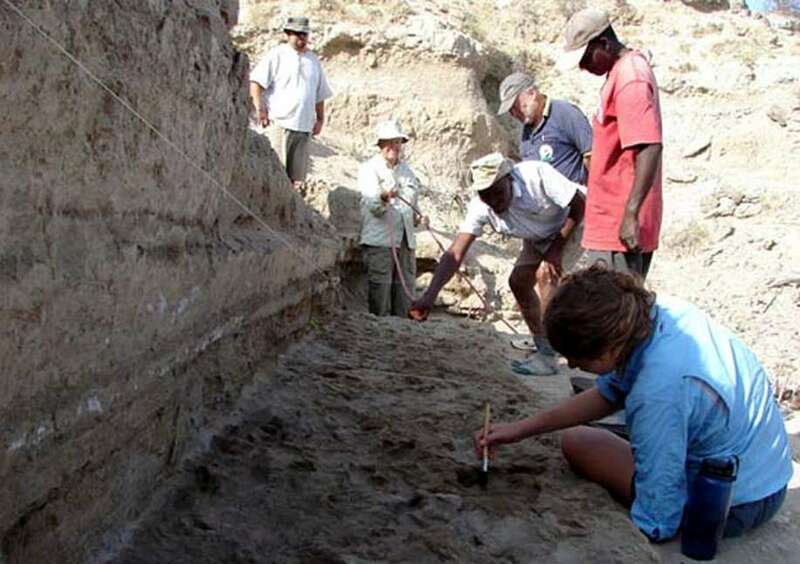 The discovery will be published in Science this week (14th November, 2008) by Semaw, leader of the Gona Project in Ethiopia, where the fossil pelvis was discovered with a group of six other scientists that includes IU Department of Geosciences graduate student Melanie Everett. Reconstructing pelvis bone fragments from the 1.2 million-year-old adult female, Semaw and his co-workers determined the early ancestor's birth canal was more than 30 percent larger than earlier estimates based on a 1.5-million-year-old juvenile male pelvis found in Kenya. 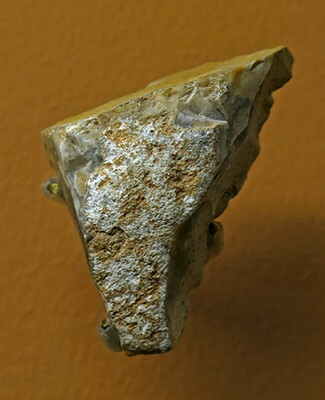 The new female fragments were discovered in the Gona Study Area in Afar, Ethiopia, in 2001 and excavation was completed in 2003. 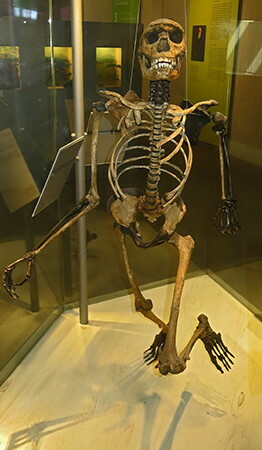 Scientists also were intrigued by other unique attributes of the specimen, such as its shorter stature and broader body shape more likely seen in hominids adapted to temperate climates, rather than the tall and narrow body believed to have been efficient for endurance running. Early humans became taller and narrower over time, scientists believe, partly due to long distance running and to help them maintain a constant body temperature. One consequence, however, is that a narrower pelvis would have been less accommodating to producing larger-brained offspring. 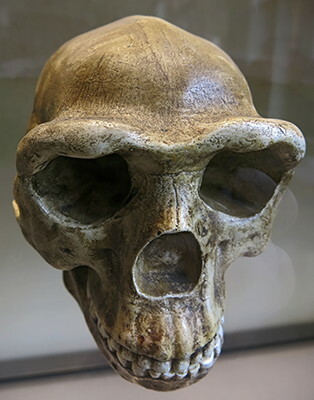 But rather than a tall, narrow hominid with the expected slight pelvic region, Semaw and the Gona researchers found evidence of a hominid ready to produce offspring with a much larger brain size. 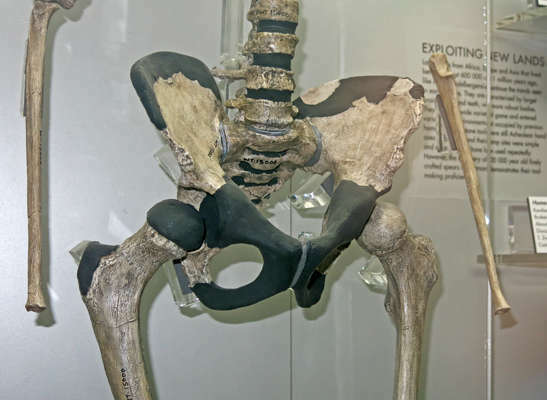 "The female Homo erectus pelvic anatomy is basically unknown," Semaw said. "And as far as the fossil pelvis of ancestral hominids goes, all we've had is Lucy (dated at 3.2 million years and also found in Ethiopia), and she is very much farther back in time from modern humans." Scientists studying early man predominantly find fragments of craniums and dental remains, while fossil bones from the neck down are rarely discovered. 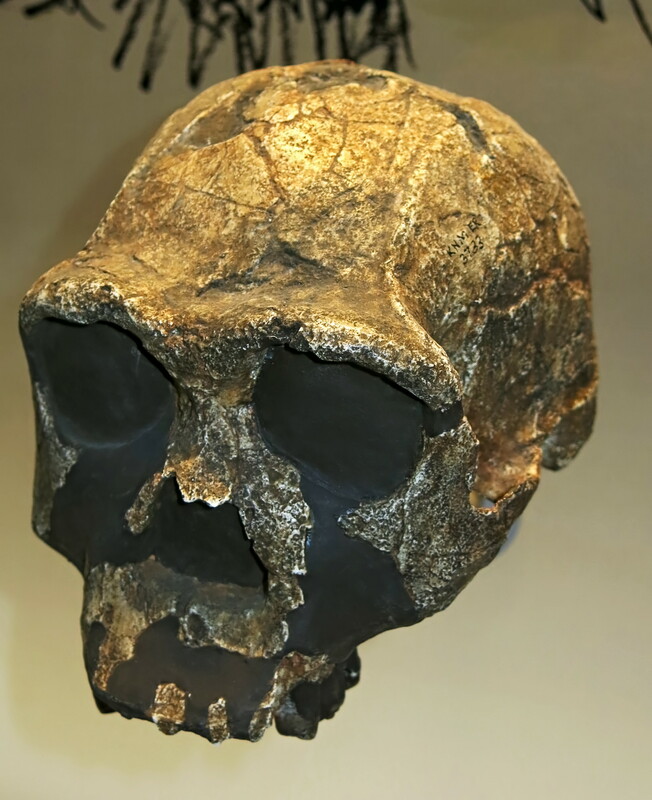 Even more difficult to verify are Homo erectus fossil bones that can be identified as those belonging to a female. Scientists had thought early adult Homo erectus females, because of the assumed small birth canal, would produce offspring with only a limited neonatal brain size. These young would have then experienced rapid brain growth while still developmentally immature, leading researchers to envision a scenario of maternal involvement and child-rearing on par with that of modern humans. But those theories had been based upon extrapolations from the existing male skeleton from Kenya. "This find will give us far more accurate information," Semaw said. Semaw is also a research scientist at the Stone Age Institute, a research center near Bloomington dedicated to the study of early human evolution and culture. It is affiliated with Indiana University's CRAFT, the Center for Research into the Anthropological Foundations of Technology. Gona has turned out to be a productive dig site for Semaw. 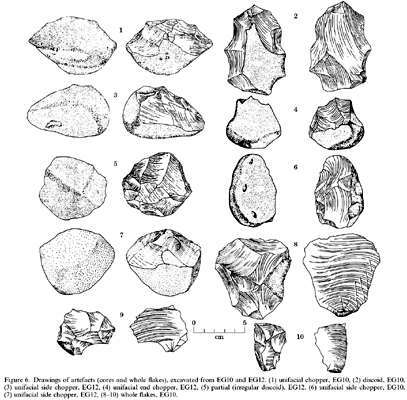 In 1997 Semaw and colleagues reported the oldest known stone tools used by ancestral humans. 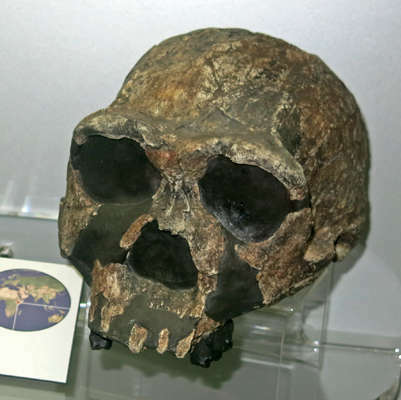 Then in 2004 he coauthored a paper summarizing Gona's geological properties and the site's cornucopia of hominid fossils spanning several million years. At the time, Science gave the article an "Editor's Choice" recognition. 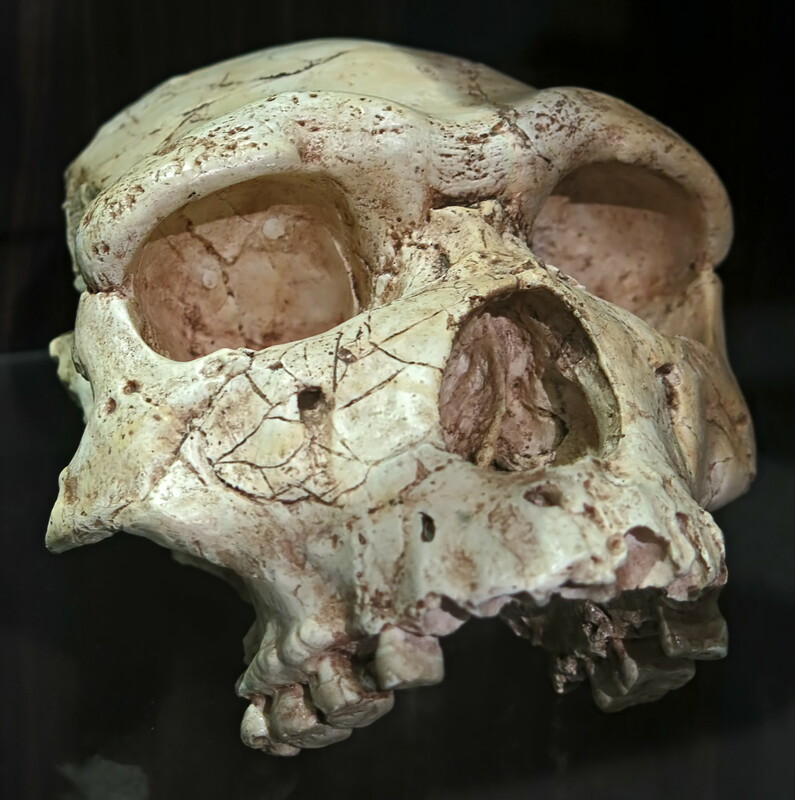 In 2005 he and colleagues published an article in Nature announcing the discovery of Ardipithecus ramidus, one of the earliest ancestral hominids, dating between 4.3 and 4.5 million years ago. 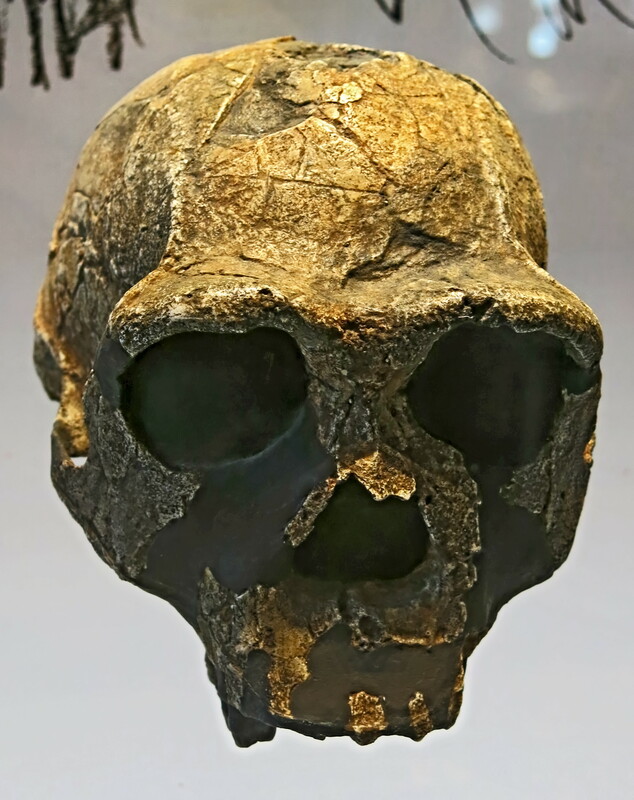 Scientists conducting palaeoanthropological field research at Gona, in the Afar Administrative State of Ethiopia have discovered a significantly complete cranium of a human ancestor estimated to be Middle Pleistocene in age. 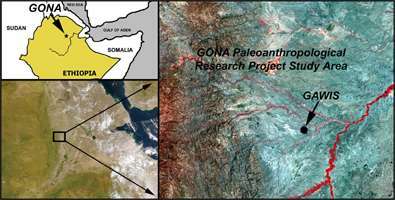 The new hominid was discovered at Gawis (pronounced "gow-wees"), in the Gona Paleoanthropological Research Project study area of Ethiopia. The discovery was reported by Sileshi Semaw, Director of the Gona Project, who is based at the Stone Age Institute and Indiana University's CRAFT Research Center, USA. The new cranium from Gawis appears to be intermediate between the earlier Homo erectus and later Homo sapiens and may be sampling a single lineage. 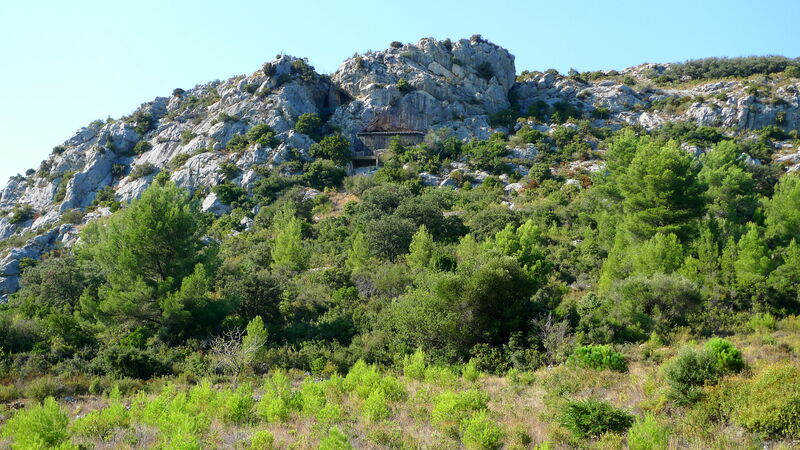 At the discovery site and nearby areas, significant archaeological collections of Late Acheulean stone tool-making tradition and numerous fossil animals were found, opening a window into an intriguing and important period in the development of modern humans. The southwest portion of the project area near the Gawis River contains the youngest part of the archive which is estimated to the Middle Pleistocene. Most of the sediments containing the cranium are sands and silts, not datable by standard geologic methods. However, the region contains many active and recently active volcanoes that erupted periodically, blanketing the local landscape with thin, gray-colored layers of volcanic ash. These volcanic ash layers hold the key to dating the Gawis cranium and associated stone tools. Some ash layers in the Gona project area can be directly dated by the 40Ar/39Ar method, and others, by virtue of their distinctive chemical composition, can be matched to correlative dated layers outside the Gona area providing the opportunity to make this one of the best-dated human ancestors notes Jay Quade, Gona project geologist. The cranium was found by Asahmed Humet (project member) on February 16, 2006 while he and project scientists were conducting archaeological and geological reconnaissance survey in the Gawis river drainage basin in the Afar Regional Administration of Ethiopia. The cranium was found in a small gully at the base of a steep slope of soft sediments from which it had recently eroded. The specimen includes the braincase, upper face, and upper jaw. 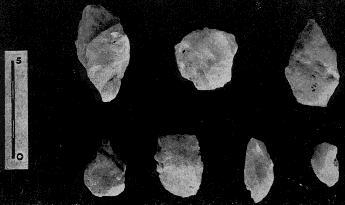 Several surface exposed stone tools were found at the hominid site. 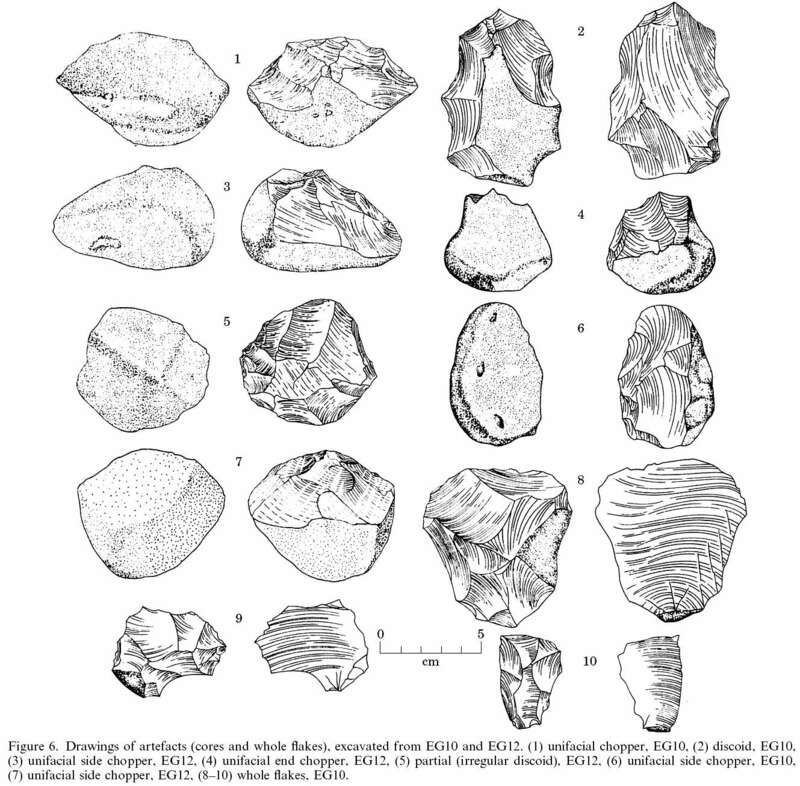 Additional contemporary stone tools excavated from the same stratigraphic level near the hominid site include Late Acheulian artifacts. 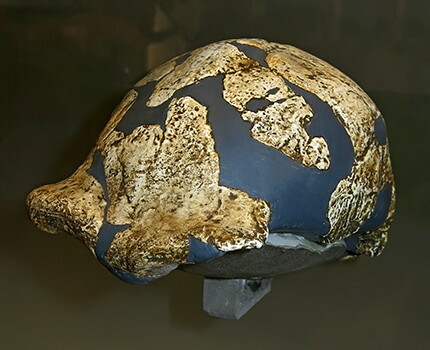 A diversity of fossil animals including pigs (two types), zebras, elephants, multiple types of antelopes, small carnivores including cats, and numerous rodents were found at the same stratigraphic level as the Gawis cranium. Semaw says that "I am thrilled to have a complete cranium discovered from Gona that can provide key information for understanding the variation that existed during the Middle Pleistocene" Scott Simpson, the project paleontologist added that "a good fossil provides anatomical evidence that allows us to refine our understanding of evolution. 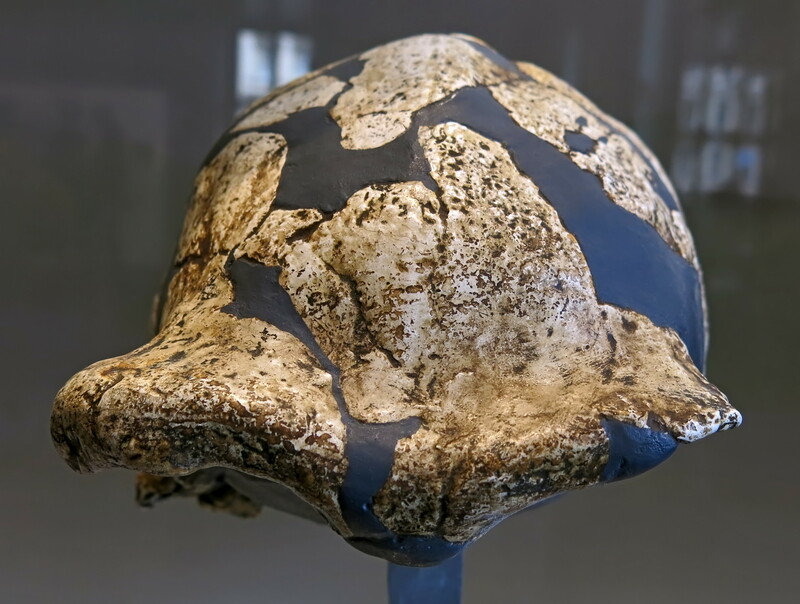 A great fossil forces us to reexamine our views of human origins. I believe the Gawis cranium is a great fossil." 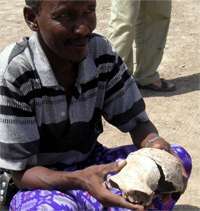 The Gawis cranium comes from a time of transition to modern humans from African Homo erectus that is poorly known. The fossil record from Africa for this period is sparse and most of the specimens are poorly dated. The few fossil crania that are known from the Middle Pleistocene of Africa present a narrow view of the range of potential anatomical variation during this period. 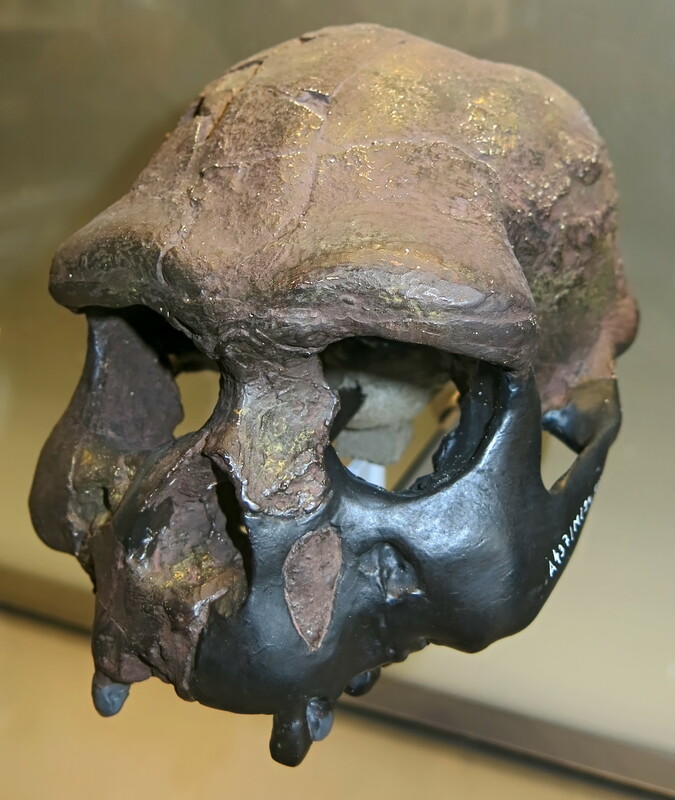 The Gawis cranium provides us with the opportunity to look at the face of one of our ancestors. 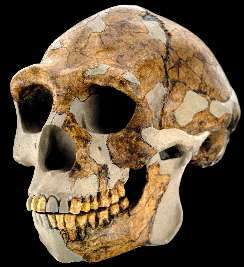 Additionally, this fossil links us with the past by showing a face that is recognizably different and more primitive than ours. 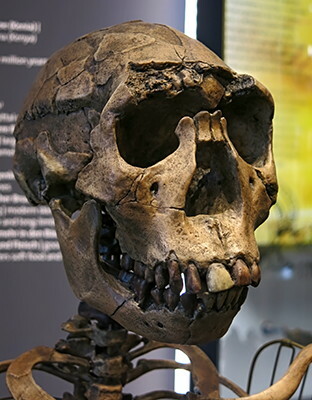 The face and cranium of this remarkable fossil are recognizably different from that of modern humans but it bears unmistakable anatomical evidence that it belongs to our ancestry. The form of the face and the brain are among the best means for exploring the evolutionary path of humans and the Gawis cranium preserves both areas. 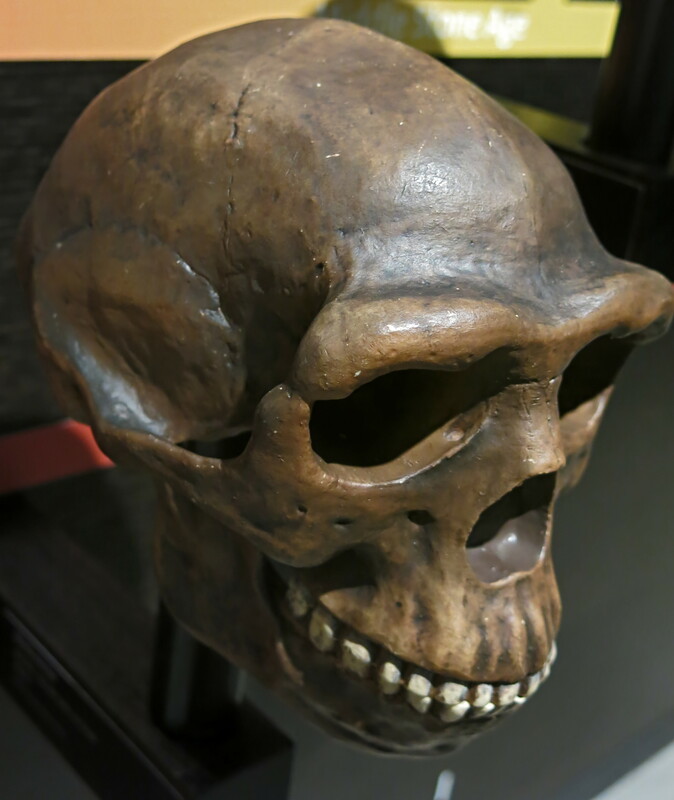 Work is in progress by the Gona team to determine the age of the cranium and associated archaeology, and to understand its evolutionary relationships with others known during the Pleistocene. Semaw concluded by saying that "I am happy that the Gona project succeeded to make a new hominid discovery from this least known time period in human evolution. Gona is a wonderful site and Ethiopian palaeoanthropology has a lot more to offer to the world. We will keep our heads up and continue our work, and I am optimistic that we will be rewarded with more thrilling discoveries for years to come." Previous Discoveries by the Gona Paleoanthropological Research Project The Gona project area has sediments that span the last 5.6 million years - a period that has witnessed many evolutionary and technological changes in human history and Gona has already provided evidence that allow a better understanding of those changes. The Gona archaeological sites are known for the discovery of the oldest excavated stone tools in the world dated to 2.6 million years ago. Early in 2005, members of the Gona Project announced the discovery of hominids assigned to Ardipithecus ramidus, among the earliest hominid genus in Africa dated between 4.5-4.3 million years ago. CRAFT Research Center, Indiana University, 419 N. Indiana, Bloomington, IN 47405, U.S.A. 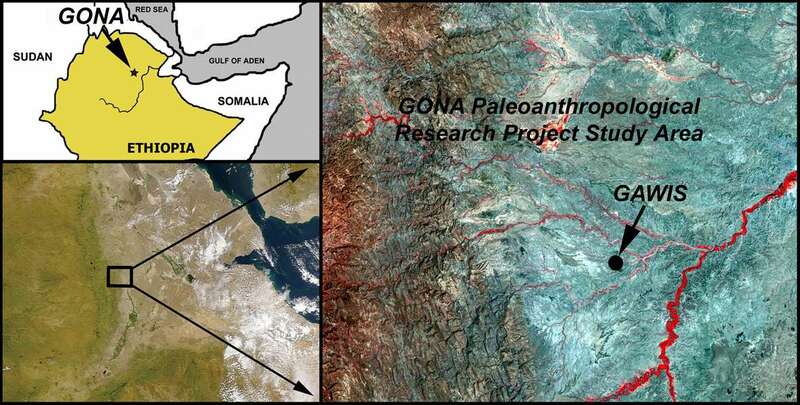 The Gona Palaeoanthropological Research Project (GPRP) study area is located in the west-central Afar region of Ethiopia and it encompasses more than 500 km2 area with artefact- and fossil-rich Plio-Pleistocene sediments (Figure 1). 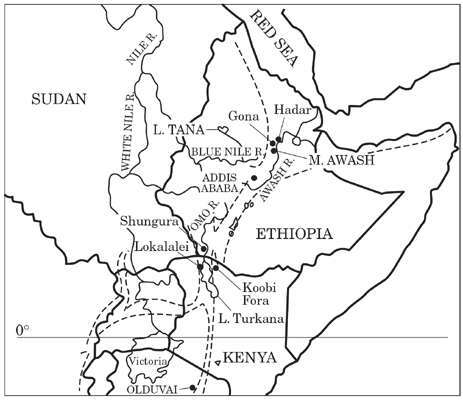 The study area is bounded to the east by the Hadar study area, to the north by the Mile-Bati Road, to the south by the Asbole River and to the west by the Western Ethiopian Escarpment. The major rivers within the study area, including the Kada Gona, the Ounda Gona, the Busidima and the Asbole, and associated small feeding streams, drain the surrounding areas flowing seasonally into the Awash River. (a) A map showing the excavated and surface-sampled Kada Gona localities. The excavated localities are shown with open circles. (b) Stratigraphy of the Kada Gona sites. Lithostratigraphy and markers from East Gona. The composite sections (93–4/2 and 93–6/7) are correlated with the magnetostratigraphy of EG12 and EG13. Stratigraphic markers are indicated next to the columns and correlations shown with solid lines. Normal polarity is indicated by filled circles, and reversed polarity by open circles. Absolute dates are provided with units of the magnetic polarity timescale (MPTS) on the right (Figure after Semaw et al., 1997). A wealth of stone artefacts and fossil fauna are currently being exposed by these drainages. 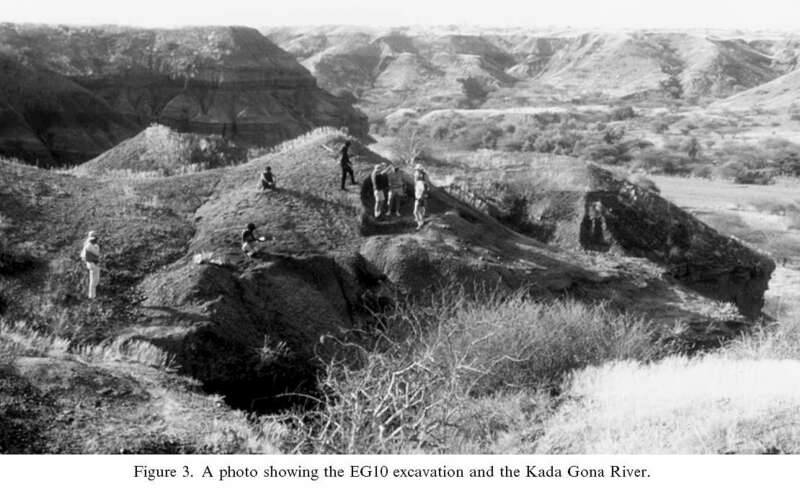 More than 40 m of sediments are exposed along the Kada Gona drainage, with at least two artefact bearing horizons documented in the time interval between 2·6–2·0 Ma. The deposits contain clays and silts, tuffaceous marker horizons and cobble conglomerates, which are prominent in the sections exposed within the Kada Gona and surrounding drainages. Erosion is rapid at Gona because of the high relief badlands topography, and artefacts and fauna are exposed by torrential rains and rapidly washed into modern drainages. Anyone trying to imagine what life was like for our almost human ancestor, Homo erectus , will sooner or later be drawn to Dragon Bone Hill. 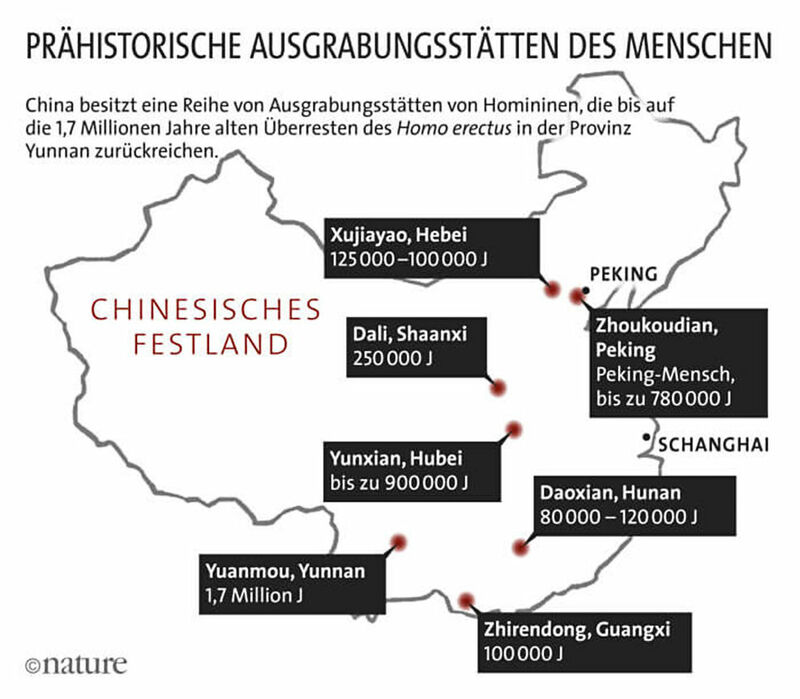 The site, which lies 40 kilometres south-west of Beijing, was home to Peking Man. Here the fossilised bones of some fifty individuals have been found with the remains of thousands of other animals from many species. The picture researchers have built up is one of cave dwelling hominids who skillfully bagged an assortment of game, butchered it at home with simple stone tools, then cooked the meat over fires before eating it. They were reputedly the first people to master fire, using it for light and warmth in their ice age homes and to scare off predators, as well as for cooking. This is a compelling reconstruction of the first hominid to possess many traits we consider to be human, and one of the most revered and tenaciously held hypotheses in palaeoanthropology. There is just one problem - our own research at Dragon Bone Hill has convinced us it is wrong. After a decade investigating Peking Man, with colleagues Qinqi Xu and Jinyi Liu from the International Zhoukoudian Research Center in Beijing, we have concluded that these individuals were neither cave dwellers, nor hunters, but scavengers. In fact, they were much more akin to early African species of small-brained Homo than to our more recent ancestors or to the Neanderthals. 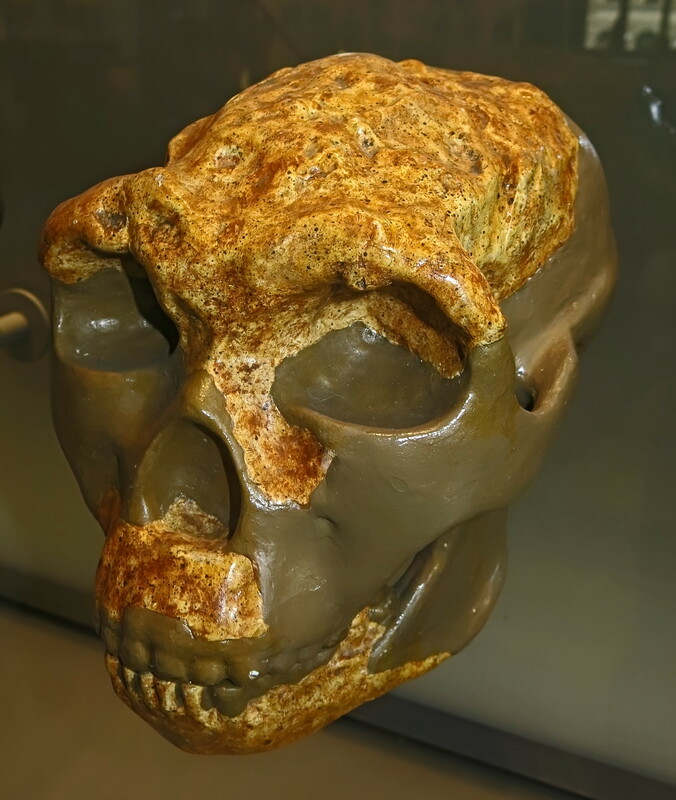 Peking Man's forebears undoubtedly had what it took to migrate out of Africa and across Asia. Nonetheless, H. erectus was still in essence a tropical animal, shunning the cold and with a tenuous grasp on fire that probably terrified them almost as much as the other animals with whom they competed for food. Dragon Bone Hill, or Longgushan, near the town of Zhoukoudian is a unique place, and now one of the UN's World Heritage sites. No other cave, with the possible exception of the recently discovered Atapuerca Cave in Spain, has yielded as many fossils of human ancestors. 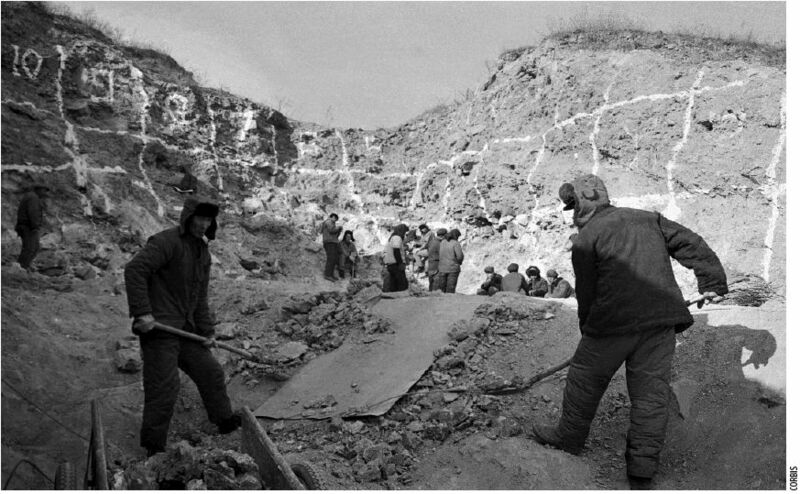 Palaeoanthropologists have wondered for decades why other sites like Zhoukoudian have not been discovered in the Far East. The answer seems to be that Dragon Bone Hill is a fortuitous accident: formed initially by river flow, the cave was then gradually uplifted by fault movements, while layers of sediment covered the bones within, protecting them from erosion. Its position, where the Western Hills, the Zhoukou river and the North China Plain meet, may also have made the site unusually popular with migrating ungulates and carnivores and hominids looking for shelter and water. 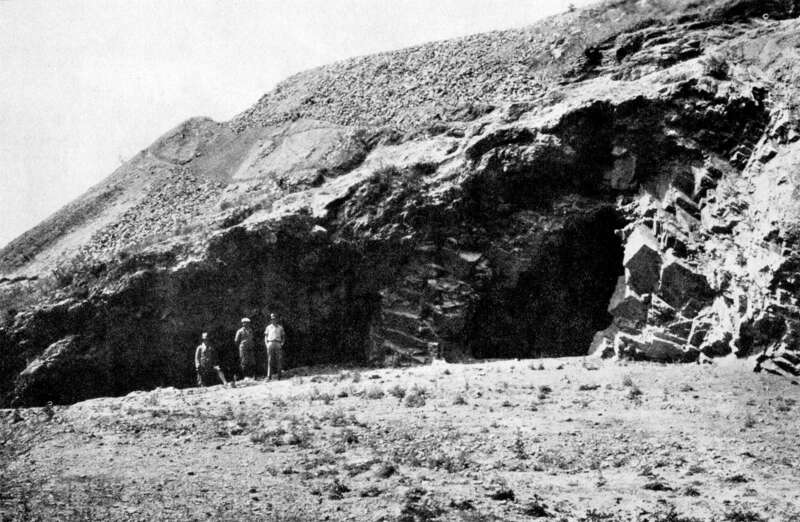 Entrance to the cave shelter of Chou-Kou-Tien, the home of generations of Pekin Man. Chou-Kou-Tien, one hundred kilometres south of Pekin, is in a gorge at the edge of the high Mongolian plain; through this gorge a stream flows down to the plain. 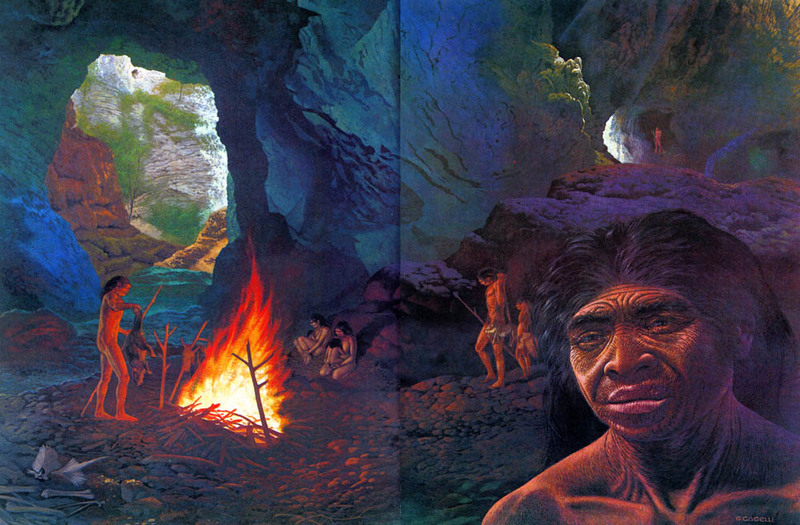 In the Silurian chalk hills, forming an anti-clinal, a large rock shelter was produced by many recurring falls of rock, and successive generations of Pekin Man, a human type closely related to the Pithecanthropus of Java, lived there for many thousands of years. 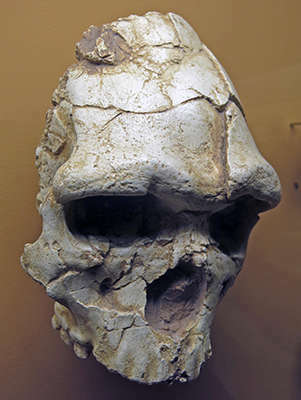 Facsimile of the Peking Man skull. Map of Homo erectus sites in China. From the start, however, the hominids stole the show. 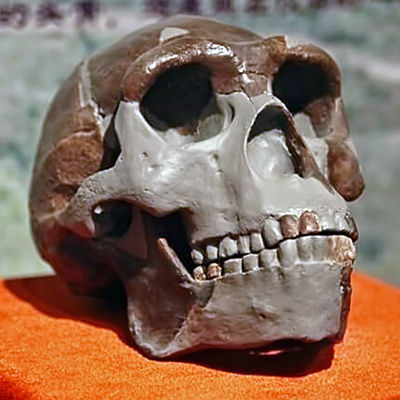 Peking Man became an international celebrity in the late 1920s following the publication in Nature of a paper by Davidson Black, then professor of anatomy at Peking Union Medical College, describing two teeth discovered in the first quarrying operations at the site. Writing about another fossil tooth discovered shortly afterwards, Black coined a new genus and species name, Sinanthropus pekinensis or "Chinese man from Beijing" for its owner. 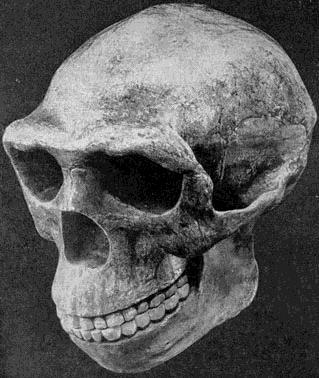 Black predicted that the hominid would look like Piltdown Man, the fossil idol of the day. But when the first skull was unearthed in December 1929, it shocked everyone. 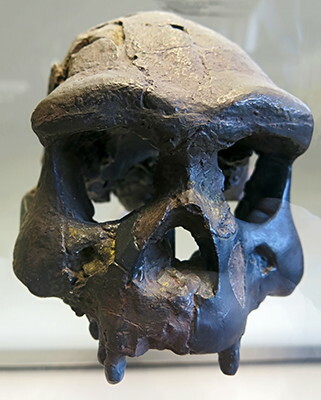 The heavy brow ridges, thick-boned skull, and low, squat profile of the head were reminiscent of Java Man, a species discovered by legendary anthropologist Eugene Dubois in the 1890s who named it Pithecanthropus erectus . Piltdown of course was a fraudulent chimera, combining an artificially stained modern human skull and a broken orang-utan mandible with filed teeth. 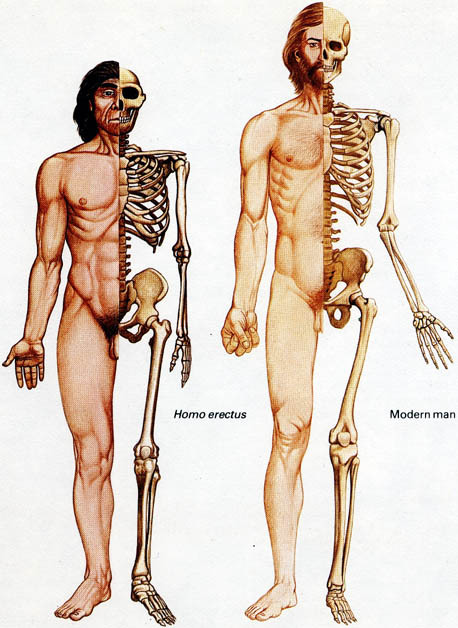 Today Peking Man and Java Man are both classified as H. erectus . Black and other early researchers had little to go on when trying to estimate the age of their hominid. By comparing other fossilised bones from the site with similar animal remains from previously dated excavations they described the cave as broadly "middle Pleistocene". In recent years two new geochronological techniques have helped pin down its age. Palaeomagnetism can accurately date particular sedimentary layers that have been deposited at times when the Earth has undergone periodic reversals of the geomagnetic poles. There are 17 sedimentary layers at Zhoukoudian and layer 14 coincides with one such reversal 780,000 years ago dubbed the Brunhes-Matuyama boundary. This finding, together with results from a new dating technique called uranium-series isotope dating, which measures radioactive decay in calcium carbonate deposits such as flowstone, indicates that Homo erectus occupied the cave intermittently from 670,000 to 410,000 years ago. This makes Zhoukoudian a relatively late settlement for H. erectus in Asia. 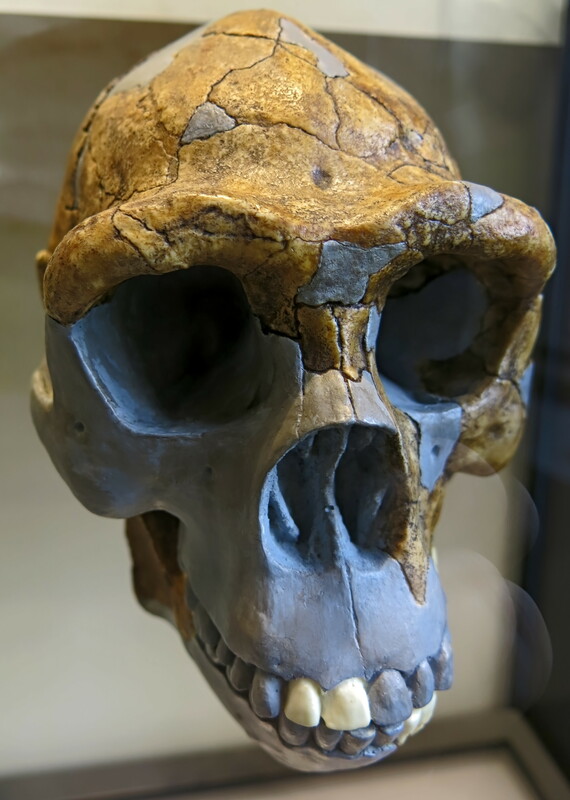 We know the species migrated out of Africa 1.9 to 2 million years ago, reaching Java at least 1.8 million years ago, according to recent re-dating of the most ancient remains there. 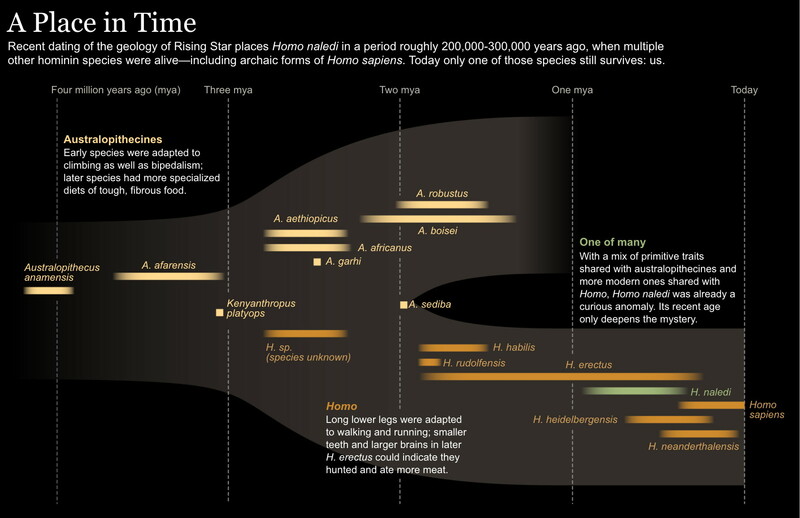 This first great hominid expansion at the beginning of the Pleistocene marks a turning point in human evolution. Climatic fluctuations during the Pleistocene, which may have been a spur for the move out of Africa (during times when Eurasia was warm and moist), could also have curtailed movement into northern parts of Asia when climate was colder. Levels of heavy oxygen-18 isotopes fall in sediments laid down during cold periods because they accumulate in glacier ice, leaving the lighter oxygen-16 isotopes temporarily more abundant in the environment. Variations in the ratios of oxygen-18 to oxygen-16 in rocks across China record fluctuations in the Pleistocene climate. Analysis of the sedimentary layers from Zhoukoudian suggests that hominids lived near the cave only when temperatures were balmy. We suspect this is no accident but indicates that these hominids were adapted to tropical climes and migrated south during the frigid periods of the Pleistocene. 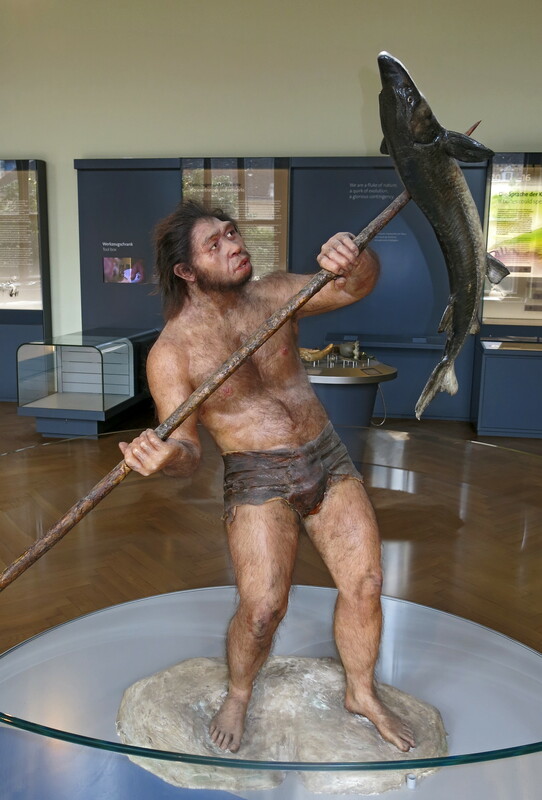 But why would Homo erectus need to leave Dragon Bone Hill when the cold weather set in? If they had fire and lived in a relatively cosy cave, could they not have hunkered down and stayed where they were during the glacial winter, just as the Neanderthals did later in Europe? Perhaps all was not what it seemed at Zhoukoudian. Was the cave actually a hominid dwelling at all, we wondered? If so, you would expect the hominid fossils to be the most complete at the site and the most numerous. But that honour falls to a giant, lion-sized hyena, Pachycrocuta brevirostris . 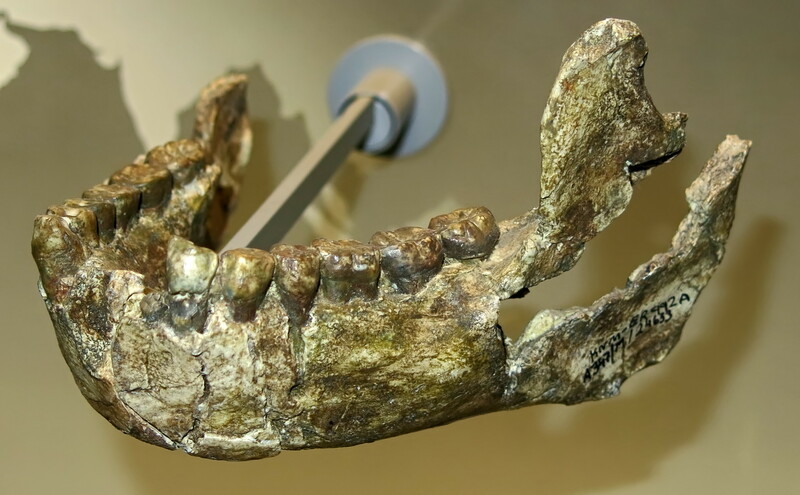 The remains of lions, sabretooths and wolves are also abundant, but hominid bones are fragmentary. And our detailed study of the fossilised remains of H. erectus , ungulates and other prey species shows a close similarity with modern bones gnawed by hyenas. So it looks as if the big carnivores, especially hyenas, were the number one residents. Hominids probably lived in more exposed places nearby, although stone tools discovered in the cave, cut-marks on bones and burnt horse skull bones indicate that they did occasionally visit of their own accord. And what about the idea that Peking Man had mastered fire? Geologist Paul Goldberg's team at Boston University has found that what earlier researchers took to be charring on hominid remains are in fact microscopic layers of detritus, probably from decaying organic matter. 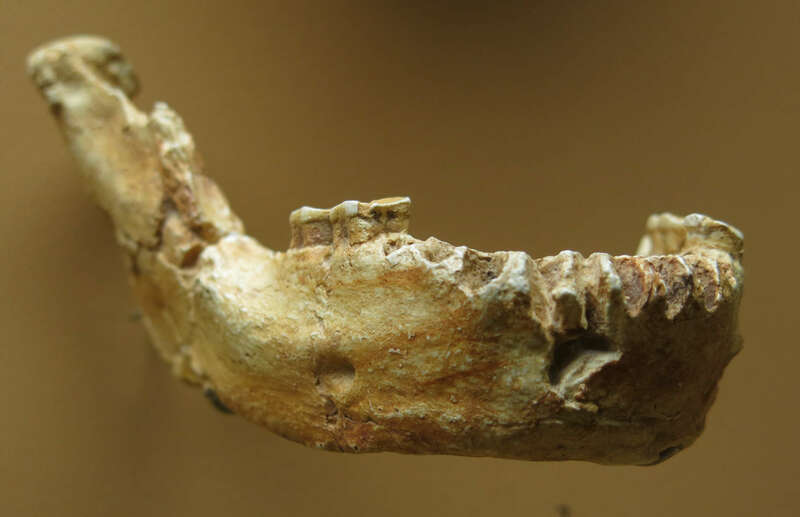 The bones in question were found in a tightly circumscribed area of the cave, which has led us to believe that they are the remains of hominids cached in a stagnant pool by hyenas that apparently never came back to claim their prize. Even the discovery of ash at Dragon Bone Hill cave is not conclusive proof that Peking Man regularly used fire. 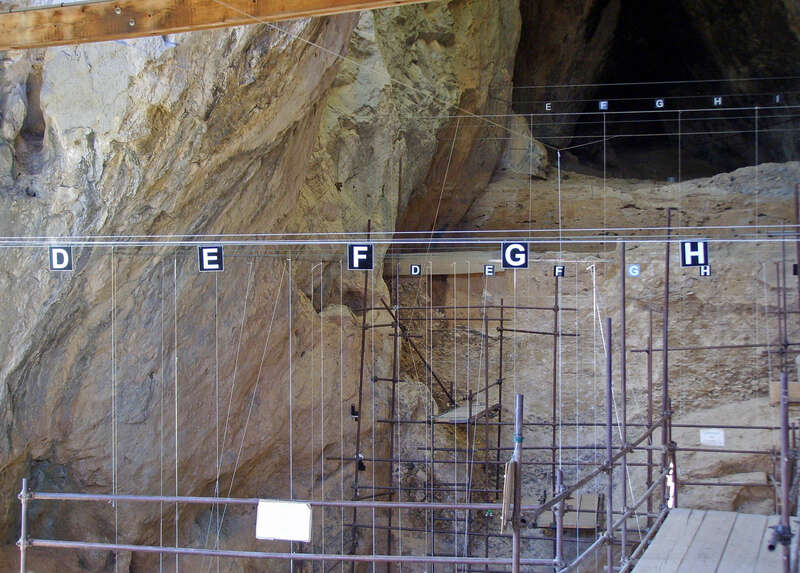 When geochemist Steve Weiner of the Weizmann Institute of Science, Israel, compared it with ash from Neanderthal caves, he found a crucial difference - no silica. Silica, which occurs in wood in structures known as phytoliths, survives burning. While the Neanderthals were obviously burning wood, the fires at Zhoukoudian seem to have been fuelled by dried guano, deposited on the cave floor by bats and owls that lived there. So, it looks as though Peking Man's grip on fire was tenuous - more like that of his ancestors in Africa, where patches of baked clay indicated single fires dating back 1.7 million years. Ephemeral fires may have allowed Homo erectus to drive hyenas and other large carnivores from their kills, but this is far from the cosy hearth-side existence suggested in the traditional picture of life at Dragon Bone Hill. Our re-analysis shatters the myth of a heroic early nimrod pitted against wild beasts and the elements, occasionally cannibalistic, managing to establish a cave home with primitive tools. Instead, it depicts a hungry scavenger skulking off to the cave, fire and sharp stones in hand, to steal away the half-chewed haunches of big carnivore kills, some of which by chance happen to be remains of its fellow hominids. Further support for this idea comes from new research on the molecular evolution of tapeworms, by Eric Hoberg from the US Department of Agriculture, Maryland. According to Hoberg, the three species of tapeworms that infest humans are most closely related to species found in hyenas, large cats and dogs. 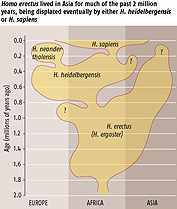 Human tapeworms diverged from these relatives 780 000 to 1.7 million years ago. This suggests there must have been very close ecological relationships between hominids and their carnivorous contemporaries - much closer than would have arisen had they occasionally shared the same prey species. We take this as further evidence early humans habitually ingested meat scavenged from large carnivores. Then there is the archaeological record. It speaks of the strangely static cultural life of H. erectus . Modern human culture changes so rapidly that almost anything we manufacture can be pinpointed to within a few years. Not so Homo erectus culture, where things stayed the same for a million years in sites ranging across Africa and Eurasia. We believe this indicates these hominids were incapable of speaking as we do, a conclusion supported by the small size of the H. erectus brain, which at 750 to 1250 cubic centimetres, is just three-quarters the size of the modern human brain. It is only with the evolution of complex language that our ancestors would have been capable of the sorts of behaviours we think of as uniquely human. 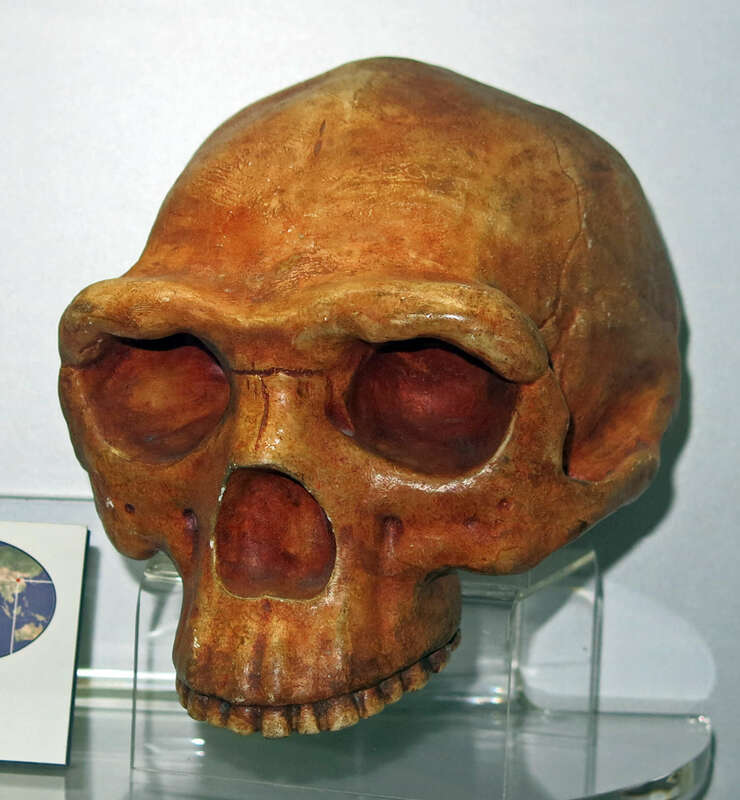 But perhaps the biggest give-away that Peking Man was far less like us than has previously been suggested comes from the fossils themselves. The most distinctive anatomical difference between Homo erectus and other hominids is the skull. The massively thick bony wall surrounding the brain - which has been likened to a tortoise carapace and a cycling helmet - has defied an adequate explanation, until now. Increasing brain size would have necessitated a larger skull, but not a thicker one. 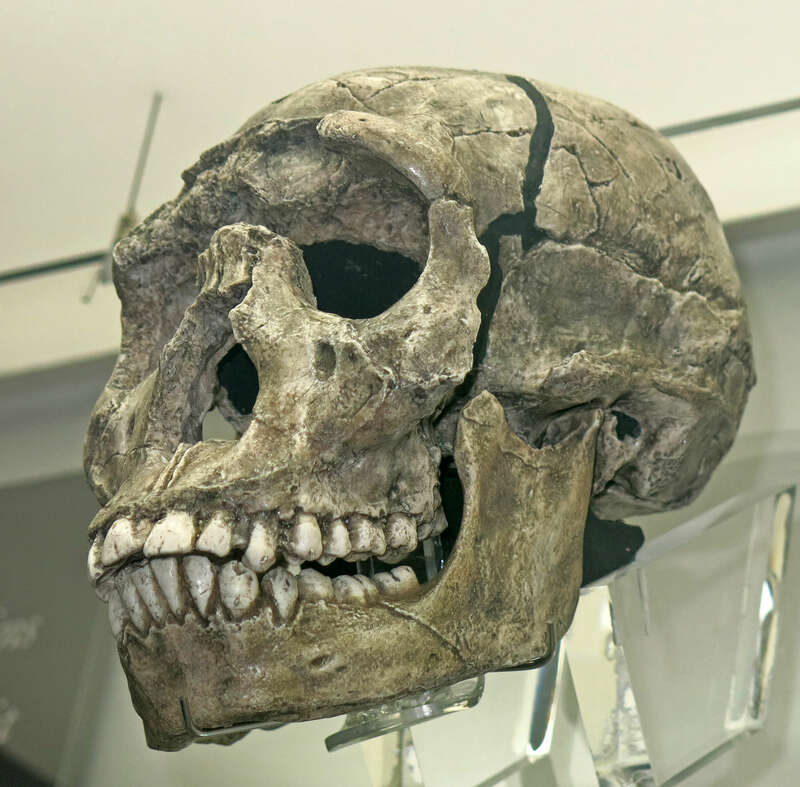 And the notion that a thick skull might have been required to support chewing muscles makes little sense since Homo erectus has smaller teeth than earlier hominids. Searching for a plausible evolutionary explanation, we looked to other species and were struck by a similarity between a variety of thick-skulled animals, from the Cretaceous dinosaur Pachycephalosaurus to bighorn sheep. All these seem to have evolved thick bone for the same purpose - protection. Could this also explain the skull of H. erectus , we wondered? And if so, from what did these hominids need protection? The answer, we believe, can be found on a number of skulls from Dragon Bone Hill. They show signs of trauma, and in particular the sorts of depression fractures that come from a sharp blow to the head. 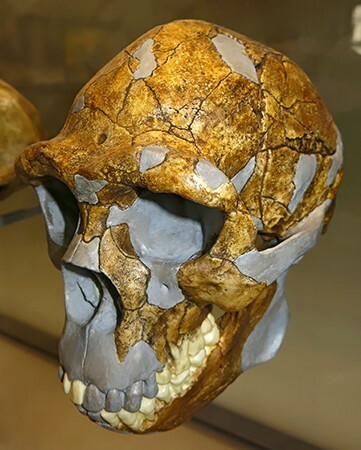 Our re-analysis of these fractures, originally identified by anatomist Franz Weidenreich on Zhoukoudian fossils in Beijing in the 1930s, have convinced us that, like some modern human populations, Homo erectus regularly resorted to head-bashing to settle disputes. This explanation is bound to disturb many people who want to believe that humanity has a basic adaptation for cooperation and sociality, but it makes more sense of the evidence than any other. Besides, we are not questioning fundamental human qualities, merely pointing out that the evolution of human behaviour may have been more complex than it initially seemed. If our work at Dragon Bone Hill has taught us anything, it is that even the most fervently held stories of human evolution sometimes need rewriting. H. erectus still has much to teach us about the evolution of human behaviour, and our work continues. The first Homo erectus started out in Africa about 2 million years ago, and spread to Eurasia shortly after that. So what happened to their descendants? There are two hotly contested theories. But our studies of Homo erectus have convinced us there is a third way. These days, most palaeoanthropologists support the Out-of-Africa theory, which proposes that groups of hominids, or perhaps waves of immigrants, moved into Eurasia at discrete times, displacing resident populations and driving them to extinction. Our reading of the fossil record, so far as it goes, tends to agree with this scenario. So too does most mitochondrial DNA research. Mitochondrial genes from all human populations have been traced back to a common ancestral genotype with roots in Africa 100 000 to 200 000 years ago. But these findings have been widely taken to indicate total genetic replacement of pre-existing Eurasian hominid populations by Homo sapiens migrating out of Africa, a conclusion that we find unlikely. MtDNA is a rapidly evolving molecule and probably cannot measure evolutionary relatedness much beyond the level of the subspecies. Additionally, the studies refer to gene lineages, not necessarily lineages of organisms, and they cannot show that specific mtDNA genes were associated together in one woman who was ur-mother to us all. Nevertheless, this line of research has added a shadowy heroine to the narrative epic of human evolution: Mitochondrial Eve. A less mainstream but equally tenaciously held view comes from the so-called multiregionalists. They maintain that resident Eurasian hominids were not all driven to extinction by the later waves of African incomers. Multiregionalists point to the anatomy of fossils to support interbreeding and genetic continuity from one time period to another within regions. But we believe the fossil record is too incomplete to support these claims. Instead, we argue, the evidence suggests relatively rapid regional evolutionary change at times, which is consistent with mass population movements. Nevertheless, multiregionalism is underpinned by sound population genetics and, we believe, is more reflective of the evolution of whole organisms than the abstract evolving gene lineages of the Eve theorists. Our own theory starts from hominid ecology and population structure. H. erectus was a widespread species evolving in parallel with its large mammalian carnivorous contemporaries in many aspects of its adaptation, such as meaty diet and large home range. We know that during the Pleistocene, these carnivores - lions, bears, hyenas and dogs - dispersed throughout Eurasia as single widespread species. H. erectus may well have done the same. If so, groups within the species would have been territorial, but also interbred freely with neighbouring groups, spreading genes rapidly throughout the range. There would have been regional clusters of more closely related populations - subspecies, races or varieties - connected to adjacent populations by gene bridges called "clines". Our "clinal replacement" model holds that H. erectus , with its carnivore-like adaptations, evolved across a broad front - genes rippling though clines as individuals found mates in neighbouring groups. Occasionally, a bigger immigrant wave might sweep over a region, replacing more than the average number of genes. But, it would not totally replace the original gene pool. Even in rare cases where immigrants displaced whole populations, some of the pre-existing genes would still remain in the region because the invaders would have shared genes with the population they replaced through their common ancestors. Ripples and waves of change could flow in different directions at different times, impelled by such vagaries as changing climate and inter-species competition. Clinal replacement fits fossil and genetic evidence. 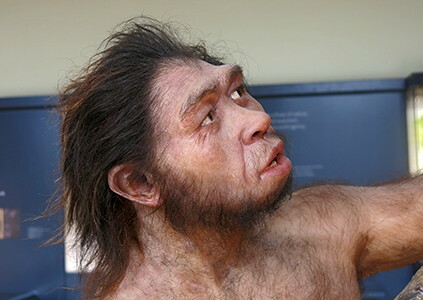 It accounts for the broad, species-level continuity in anatomical change from H. erectus to more modern Homo, and can also explain discontinuities associated with a finer analysis of the fossils. Our theory provides a more plausible explanation of the population dynamics of evolving Pleistocene populations than does the total replacement notion central to Out of Africa. Yet, unlike multiregionalism, it can explain regional extinctions in human evolution and discontinuities in the Pleistocene fossil record. Breuil, H., 1979: Beyond the Bounds of History, Scenes from the Old Stone Age, Gawthorn, 1979, reprinted from the edition of 1949, London.